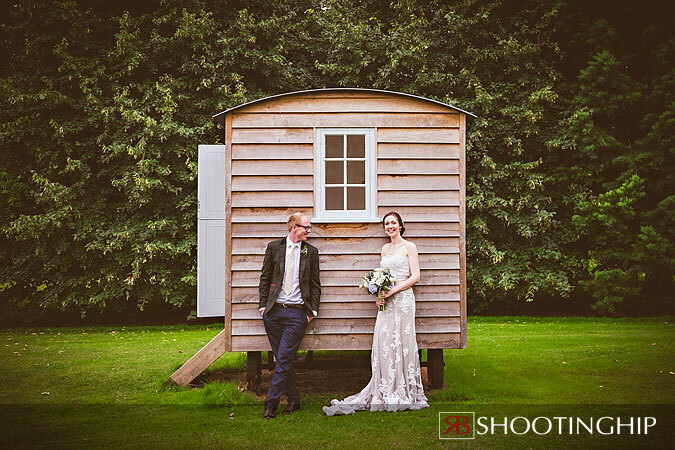 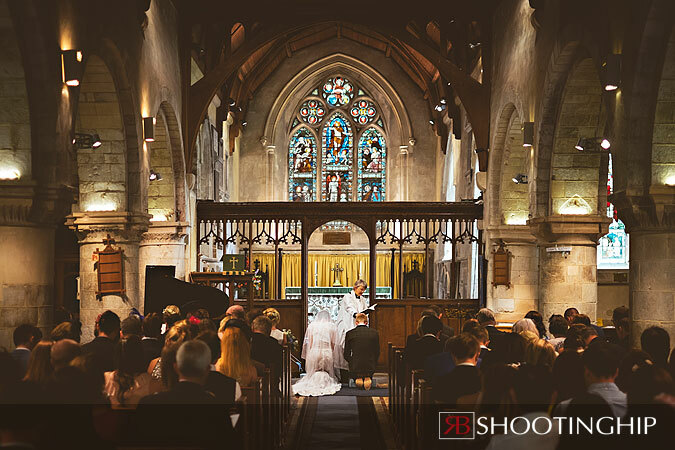 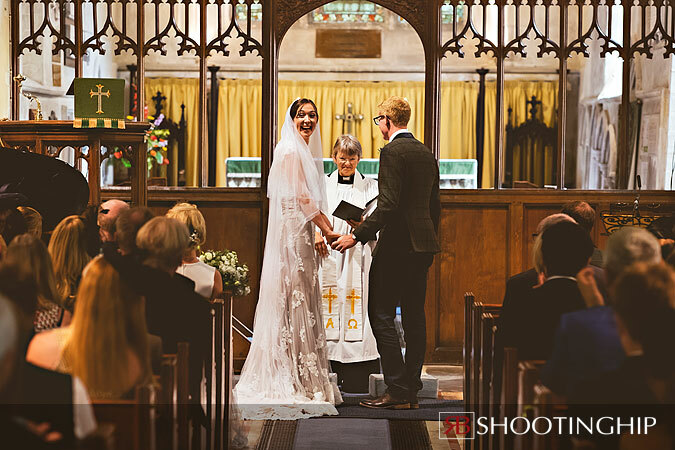 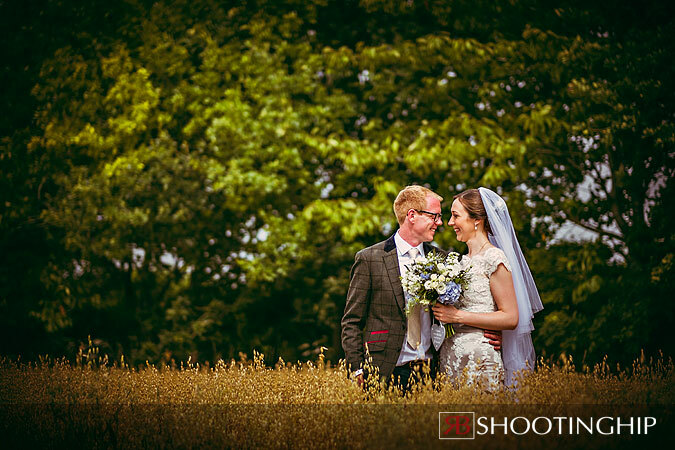 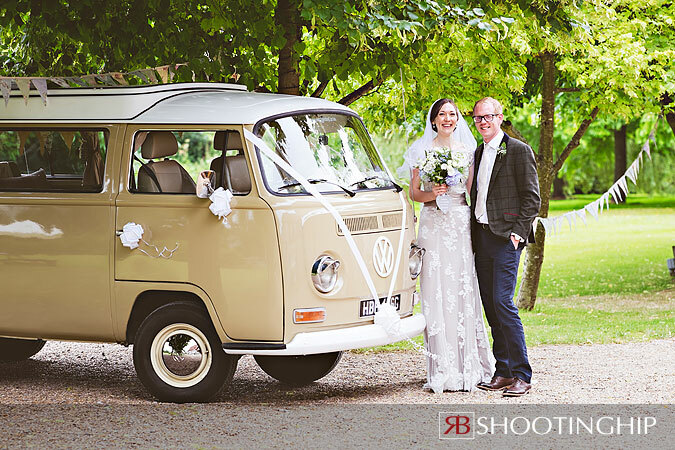 Happy, friendly, laid back couples like Emma and Andy combined with stunning locations are what make Hampshire Wedding Photography a pleasure to shoot. 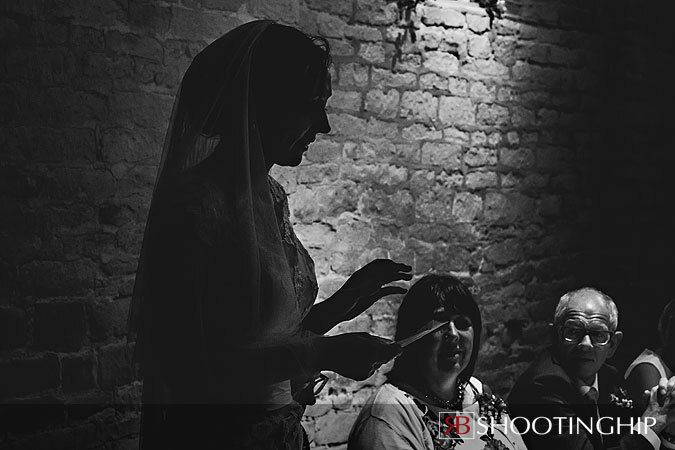 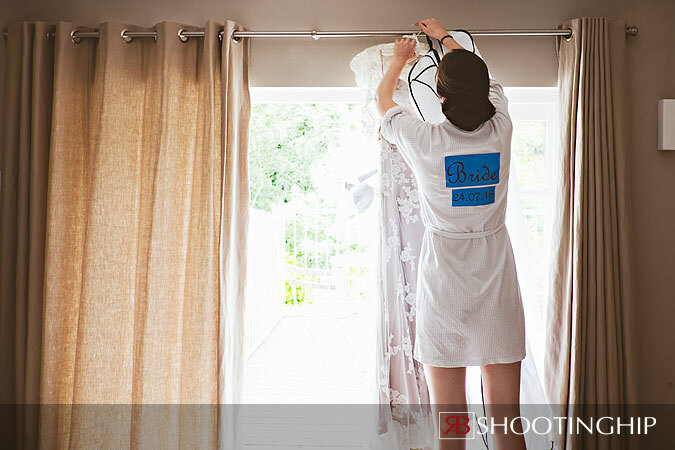 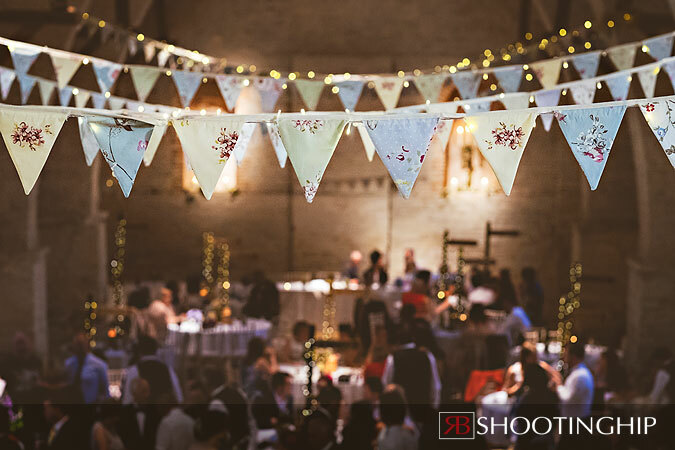 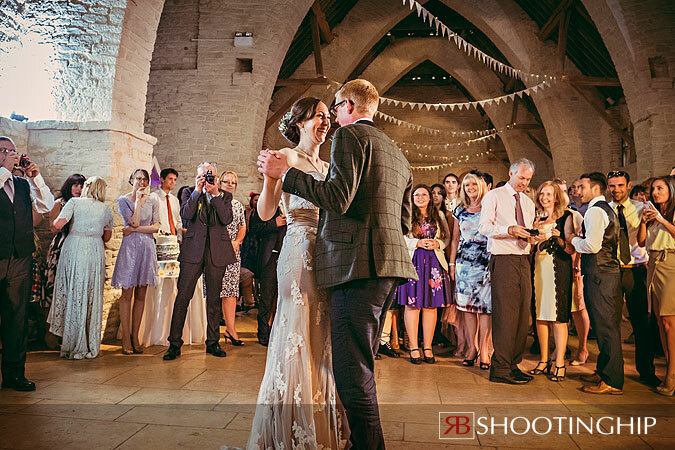 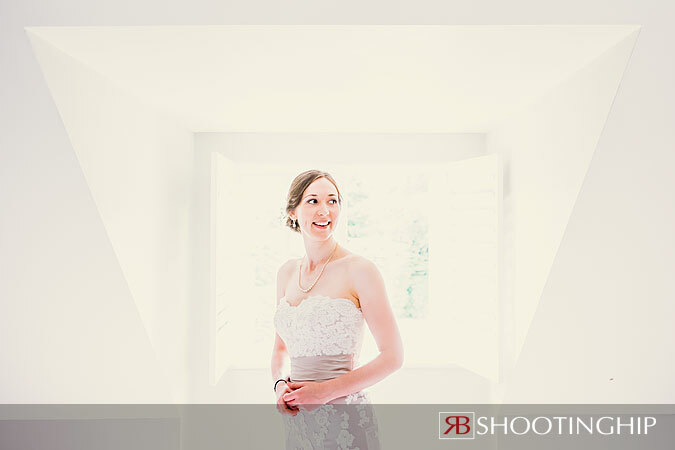 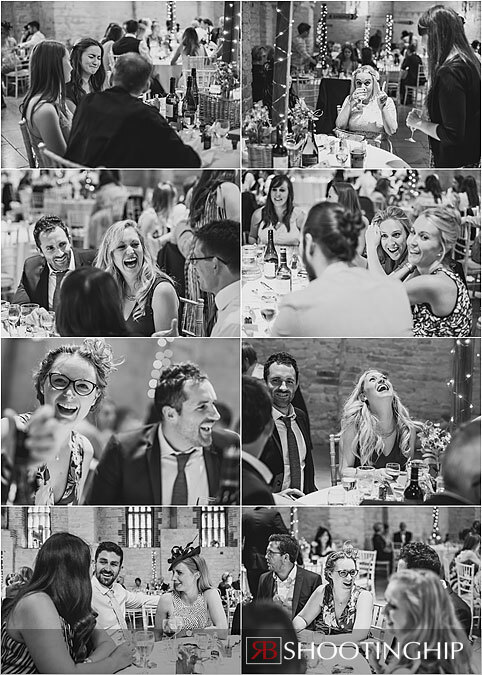 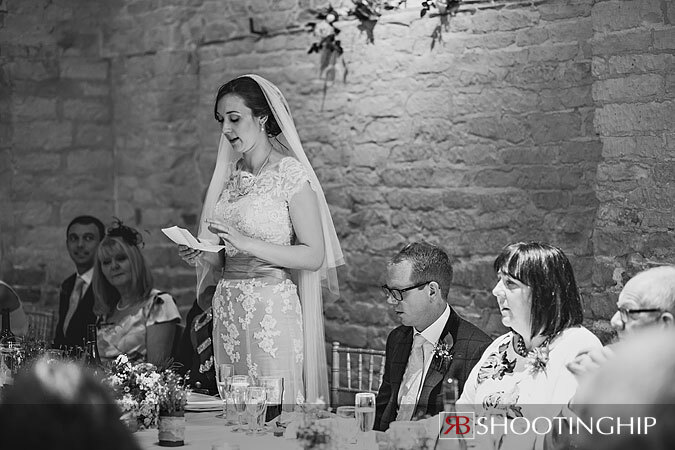 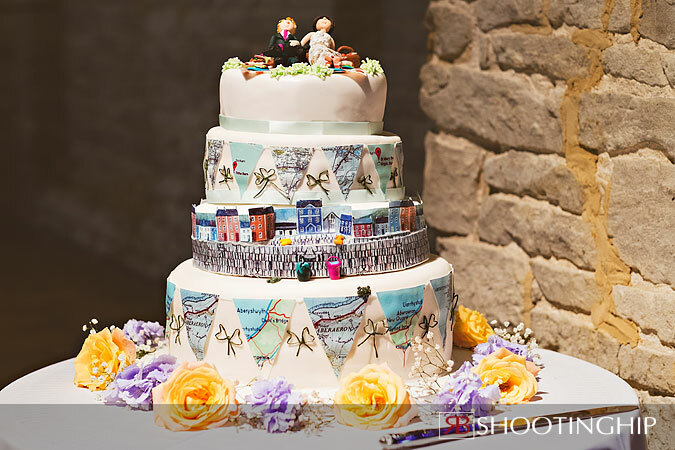 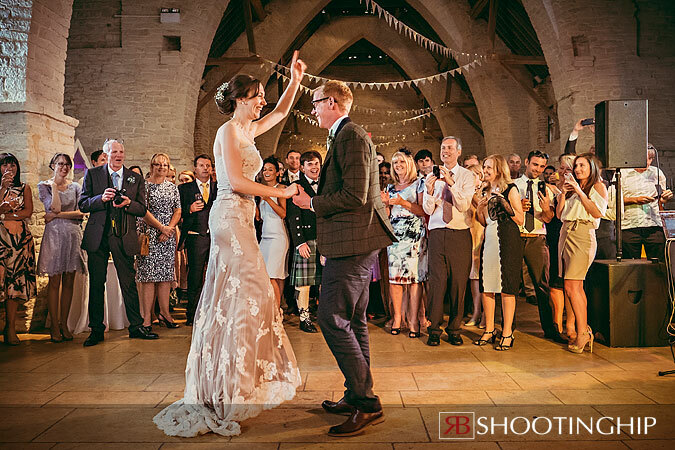 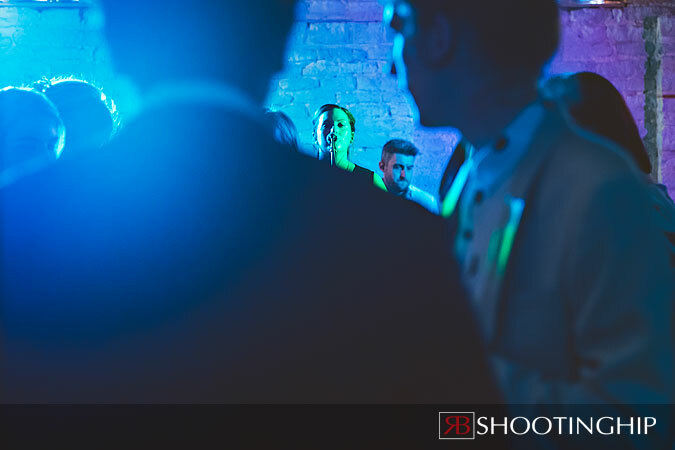 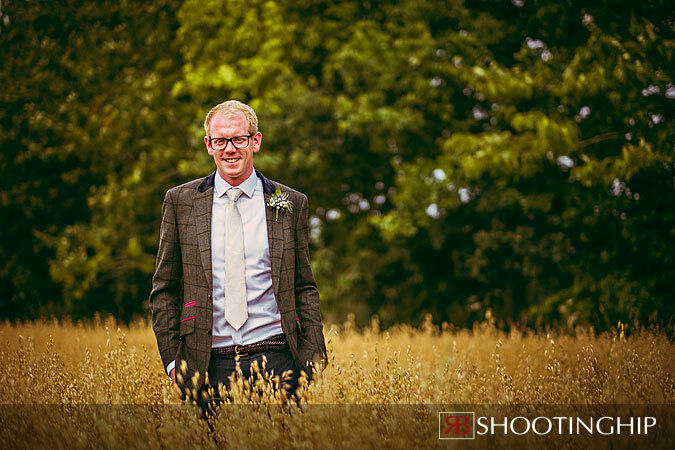 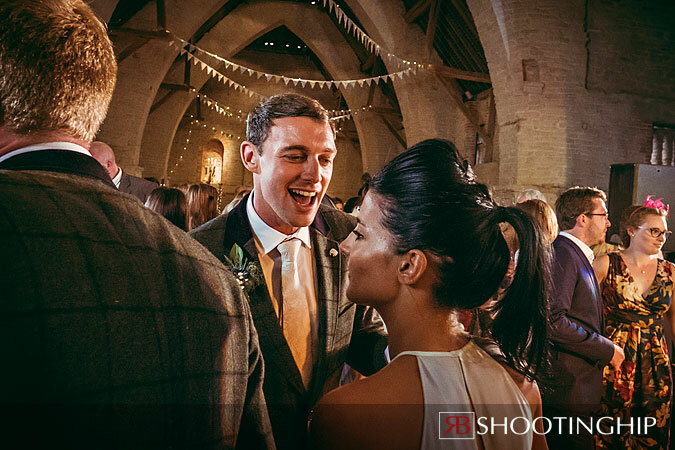 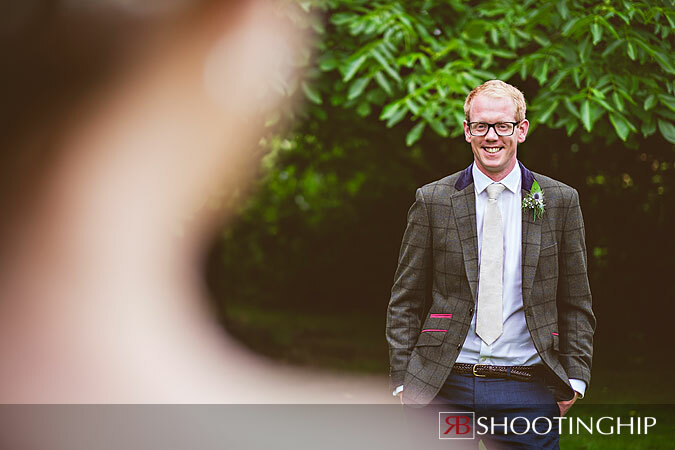 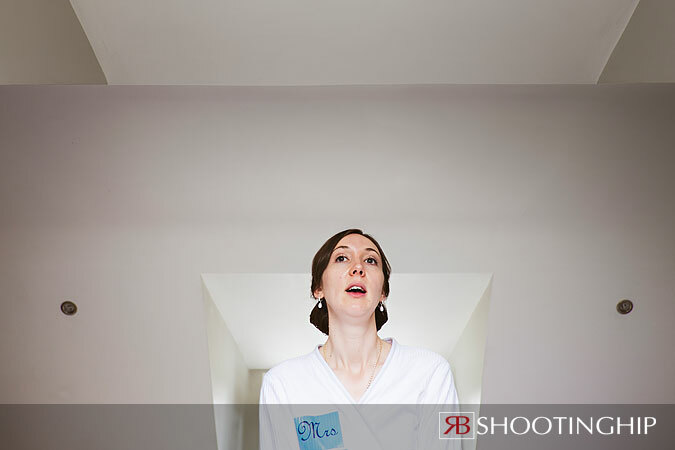 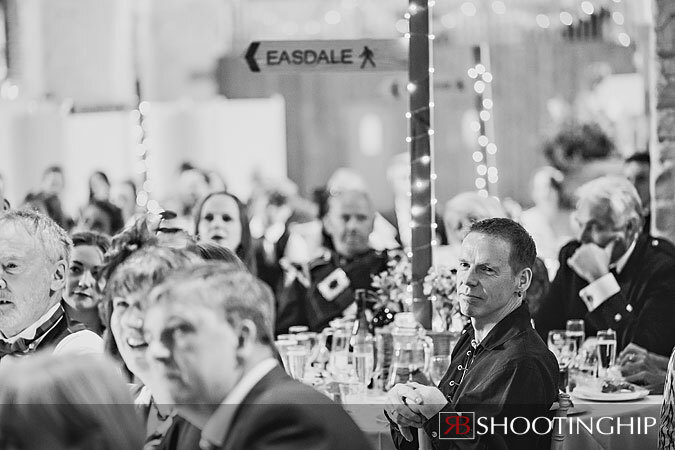 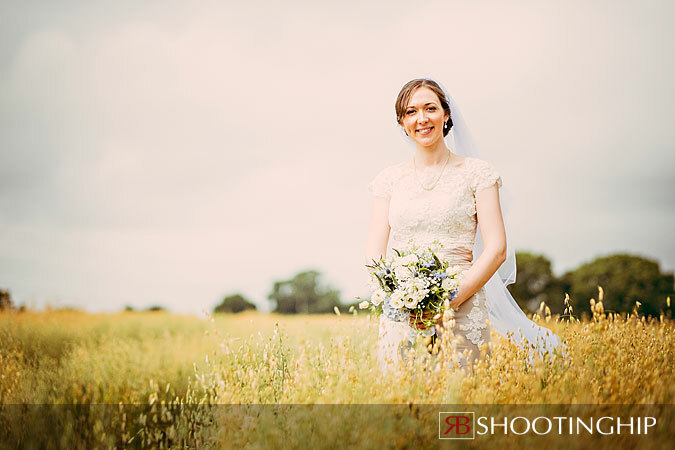 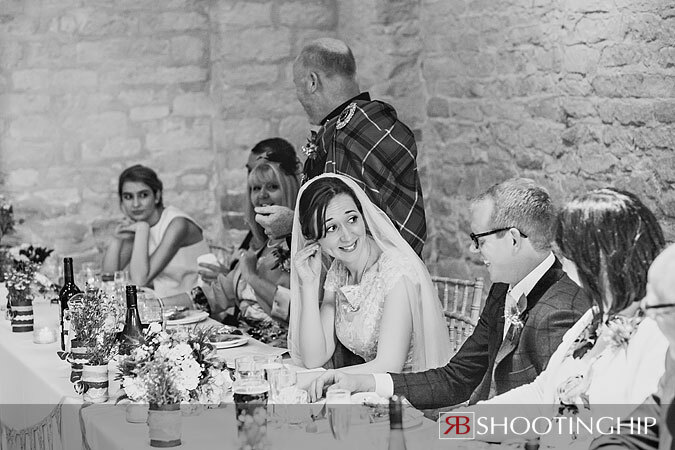 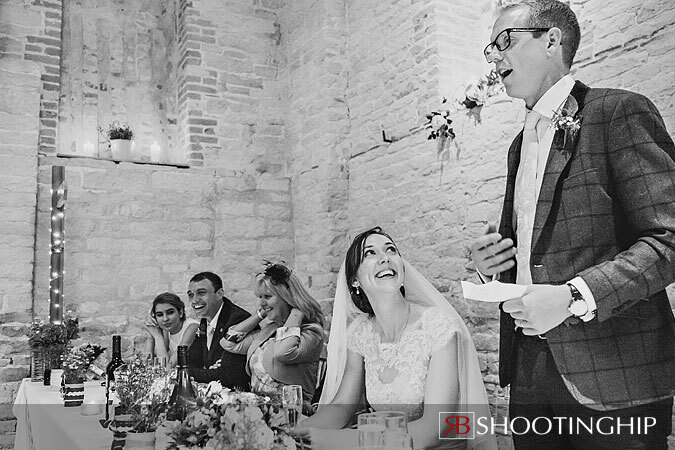 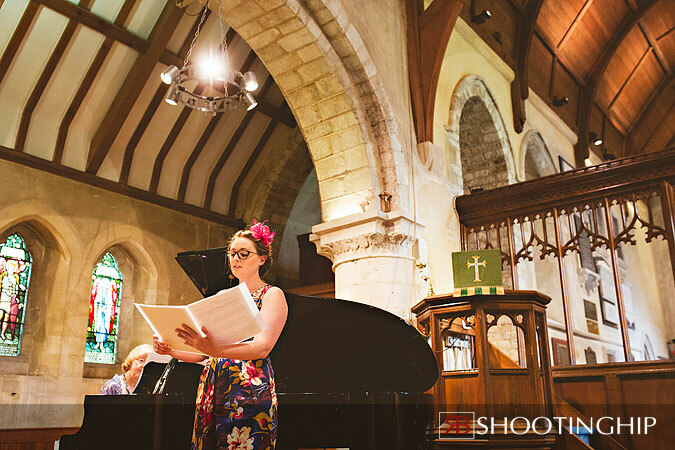 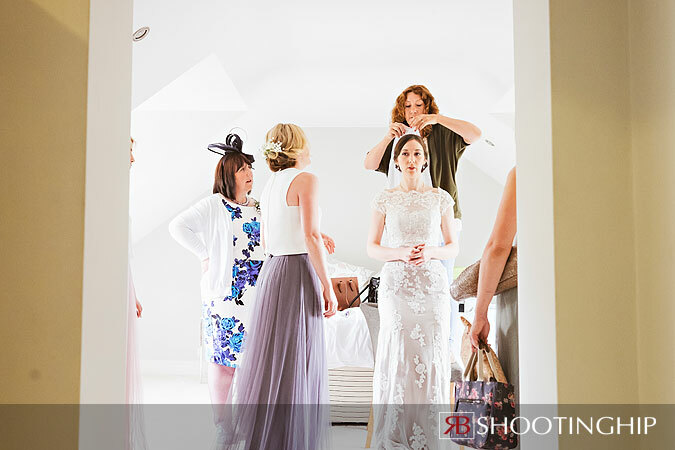 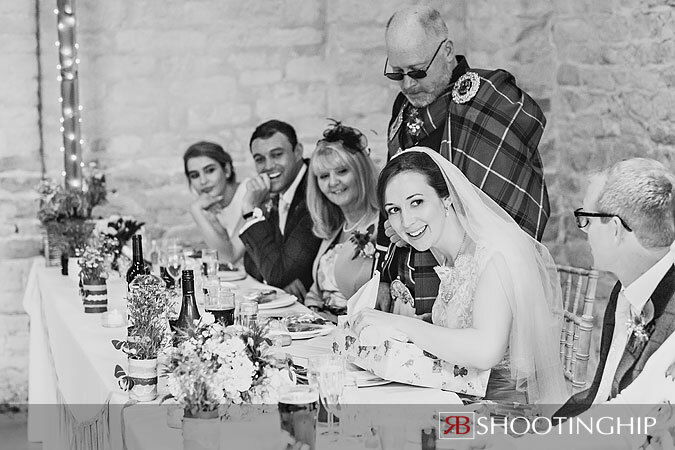 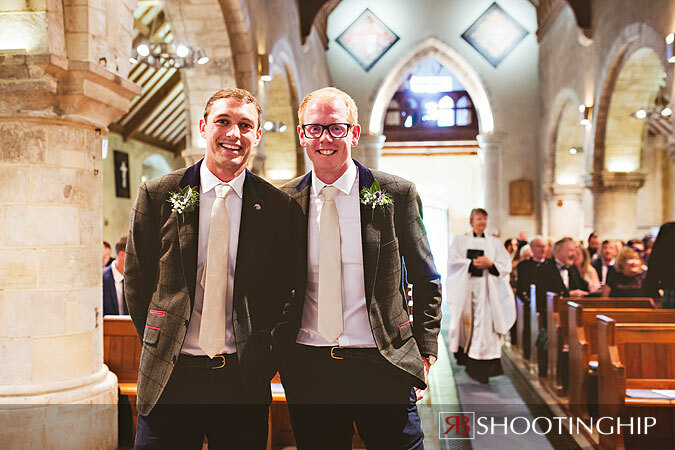 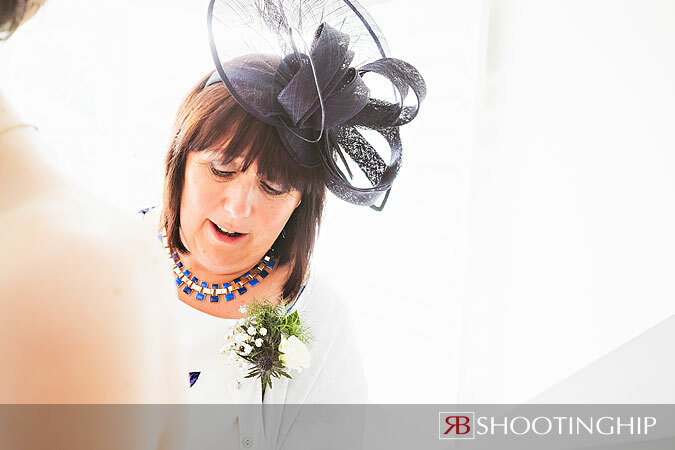 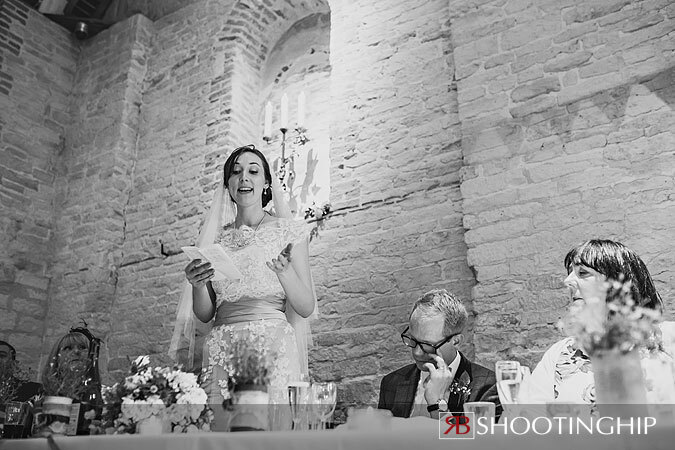 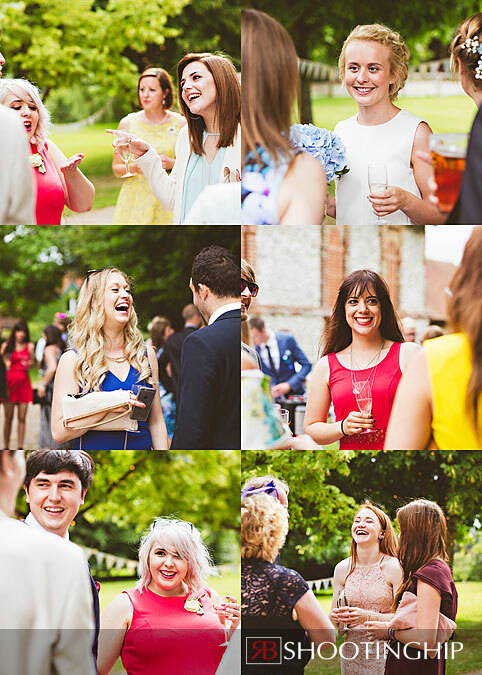 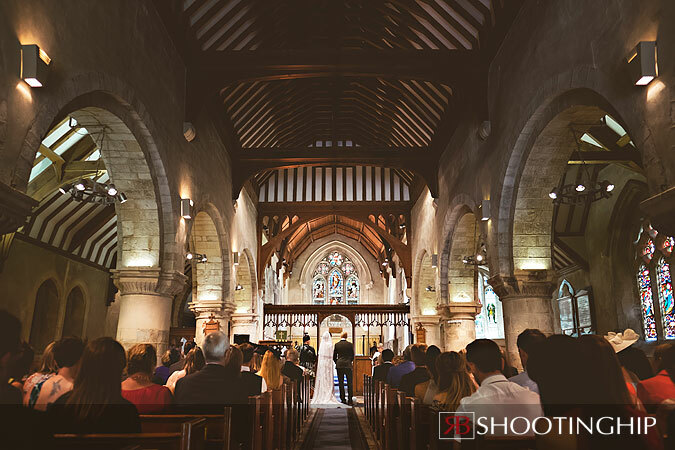 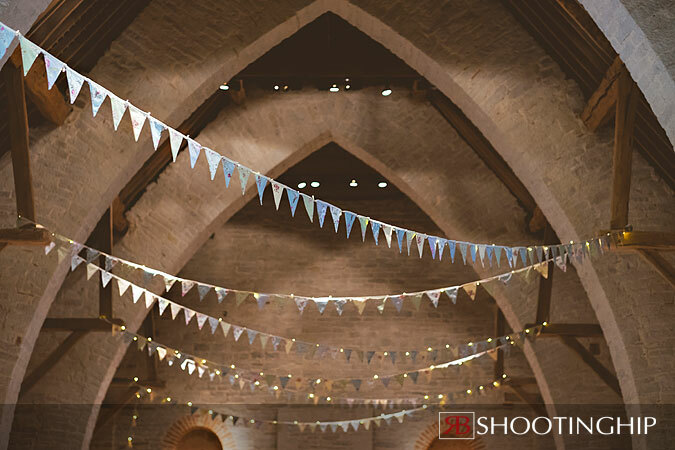 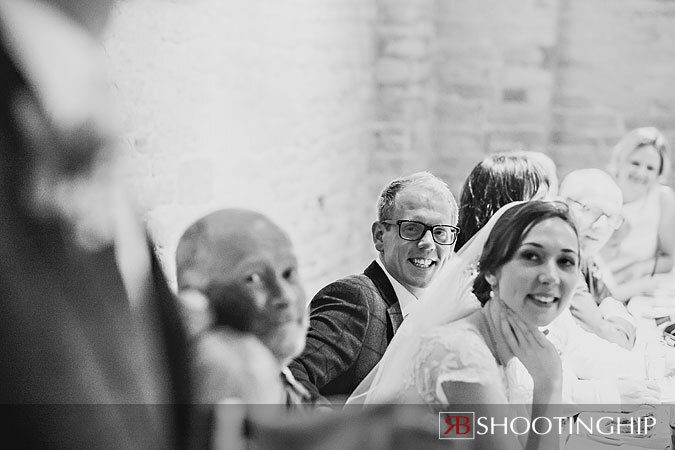 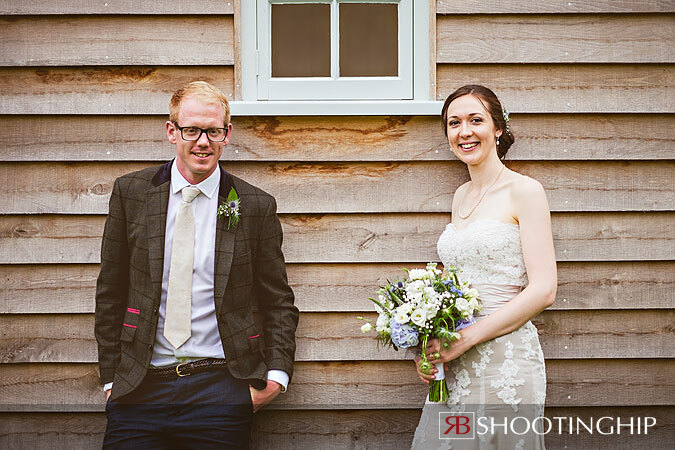 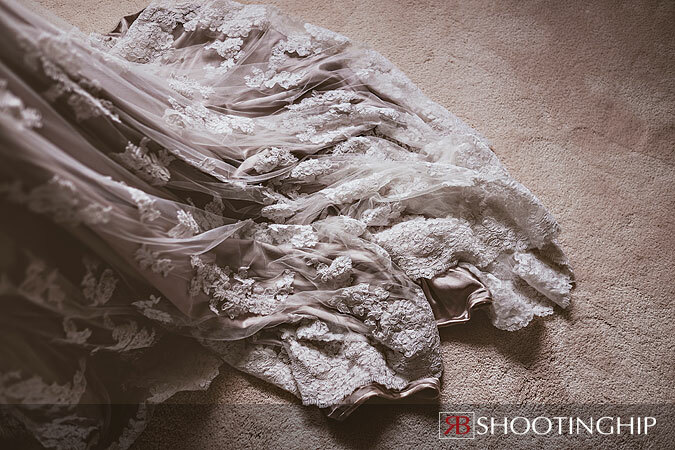 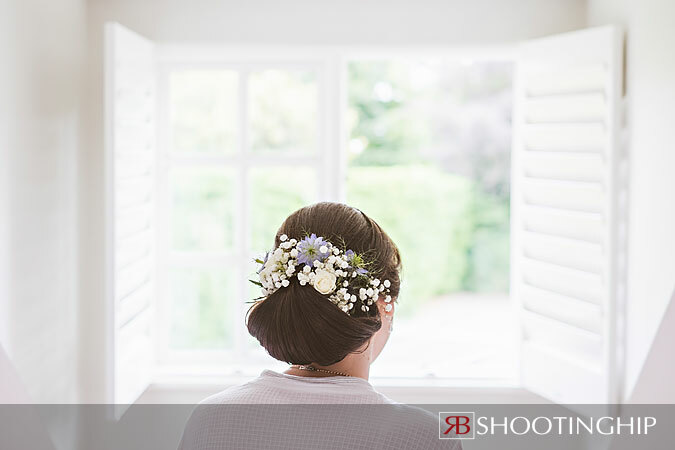 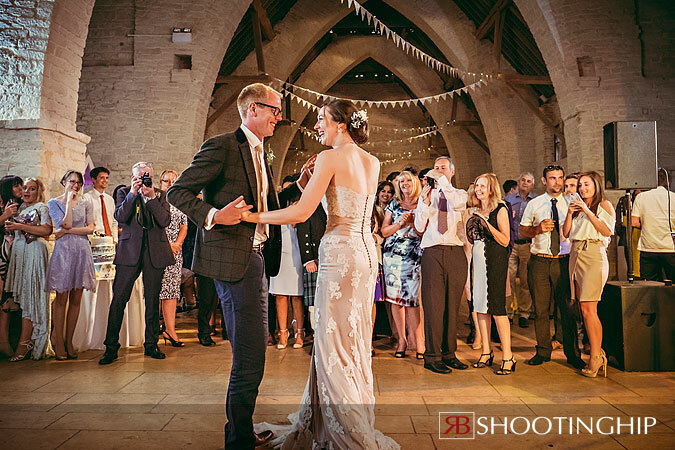 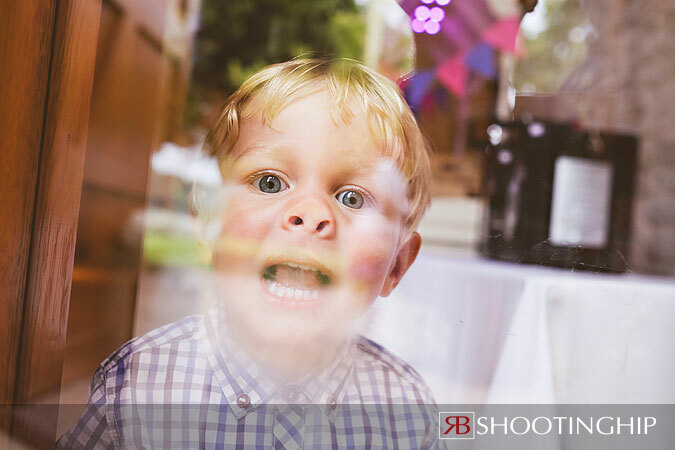 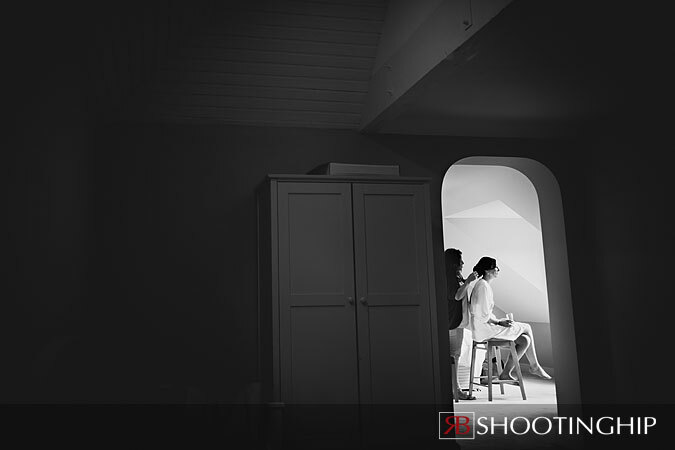 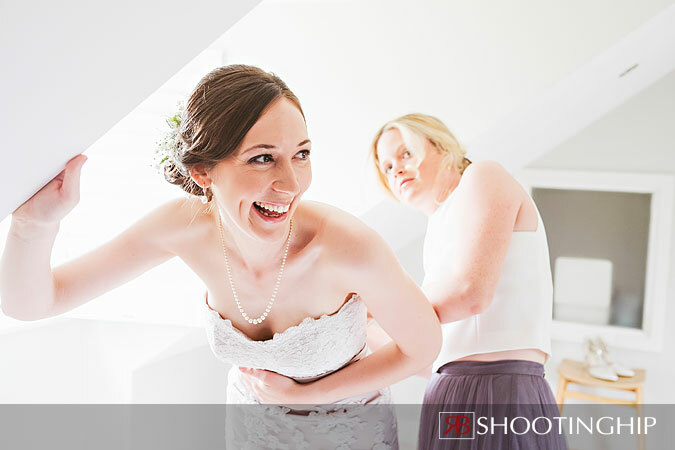 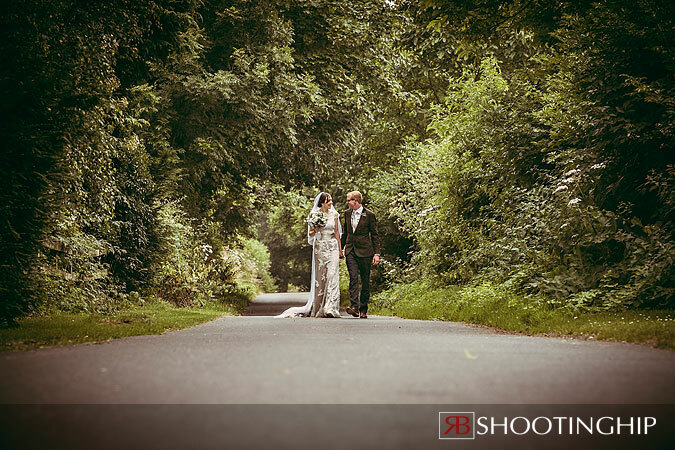 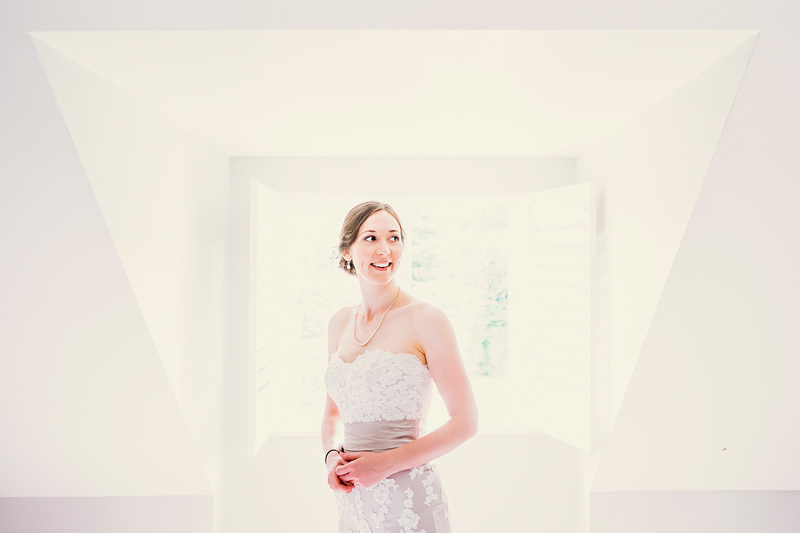 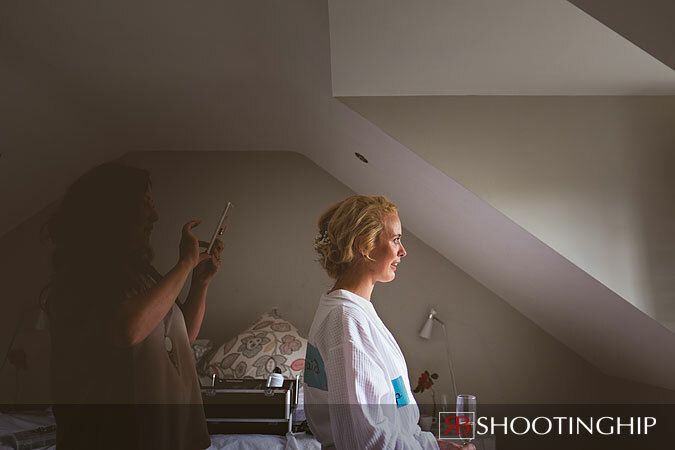 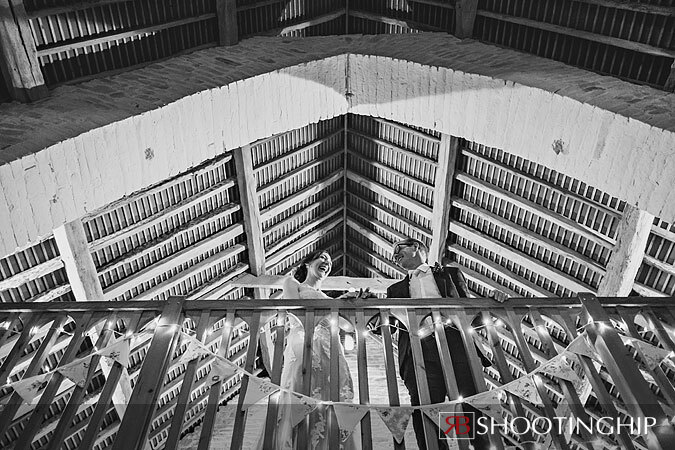 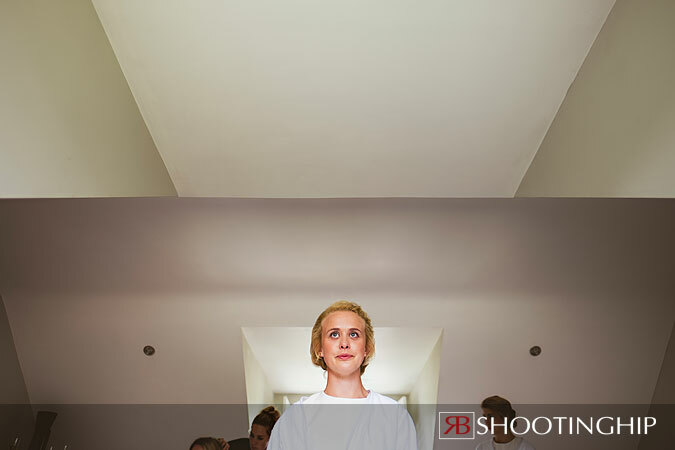 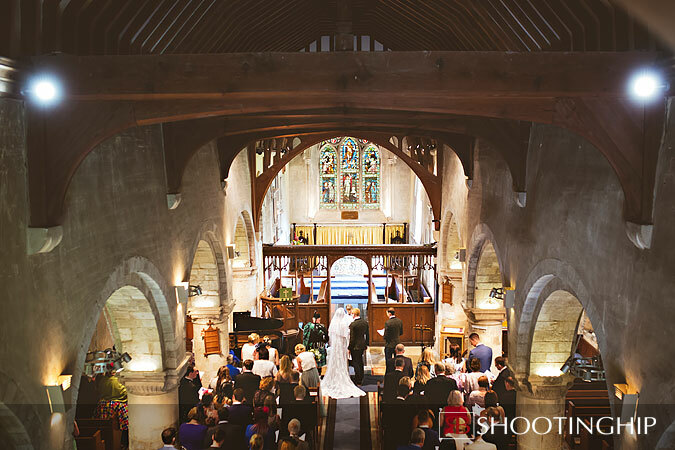 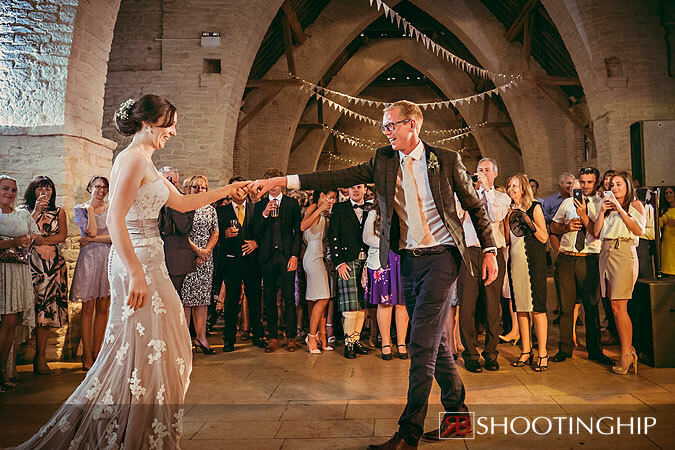 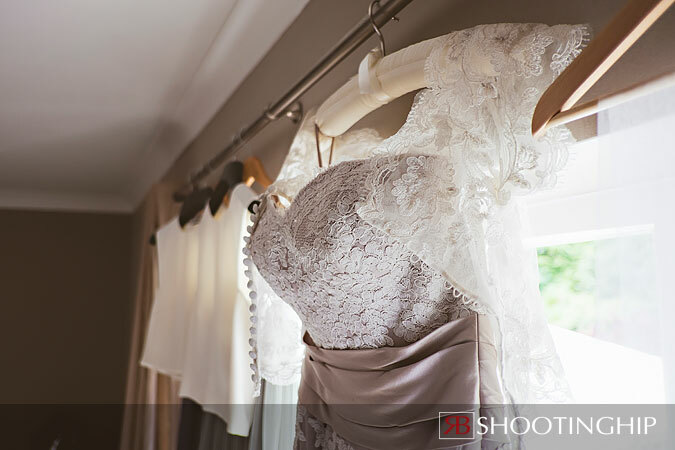 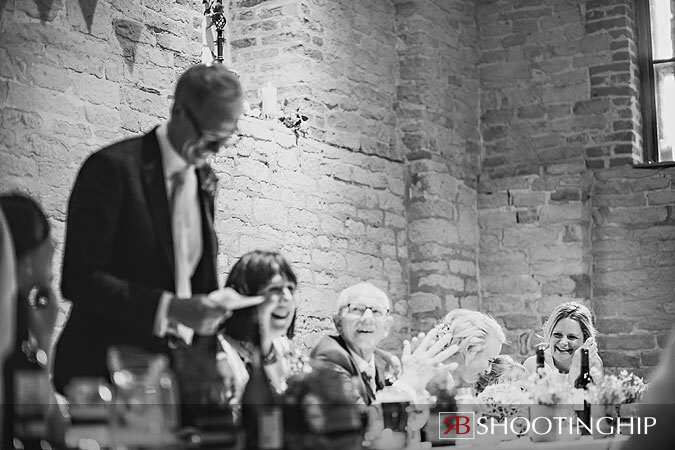 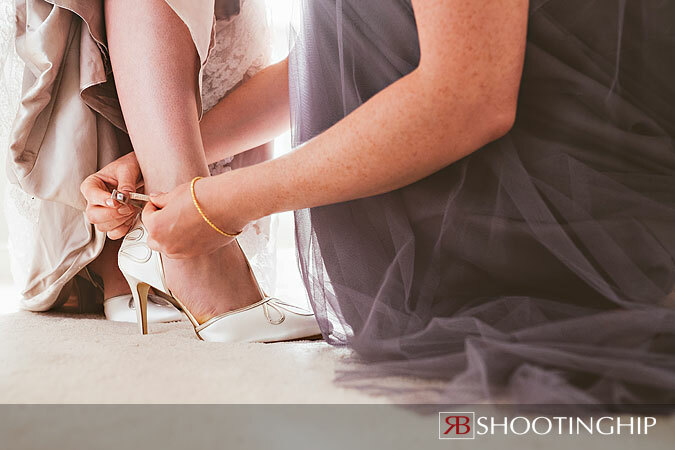 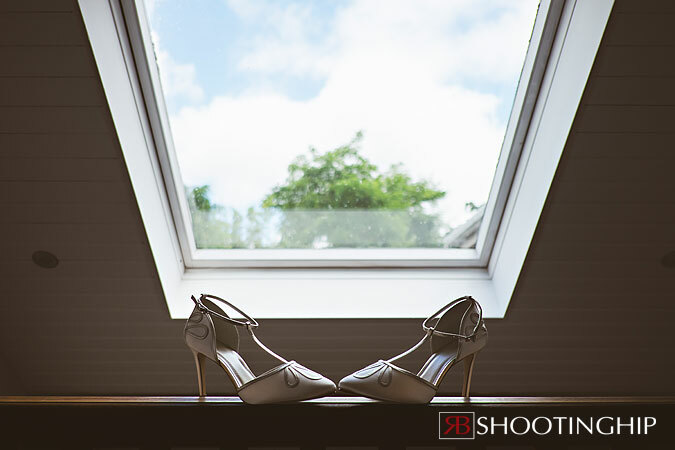 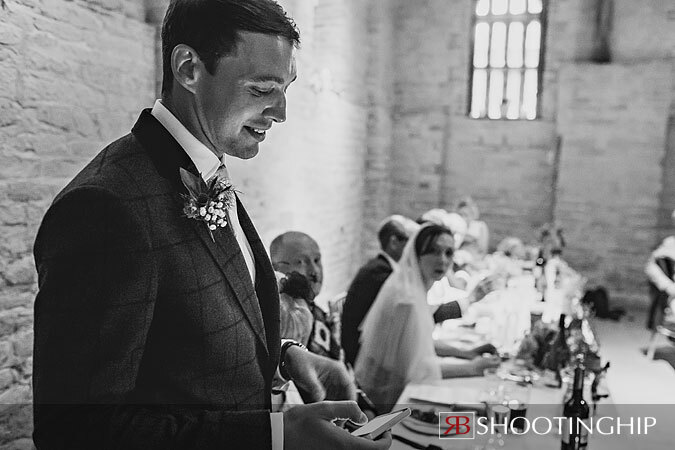 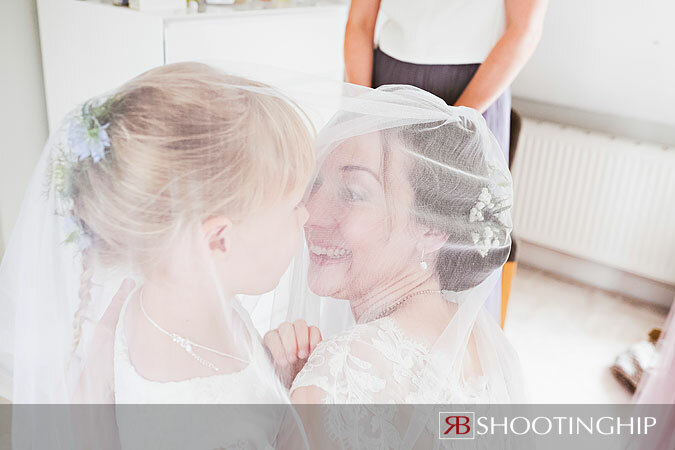 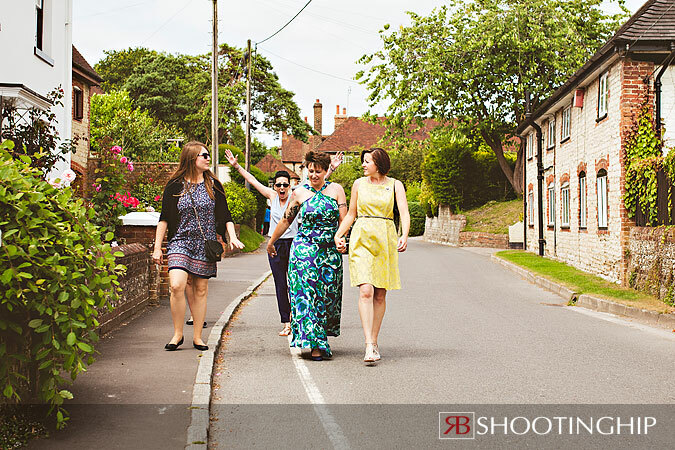 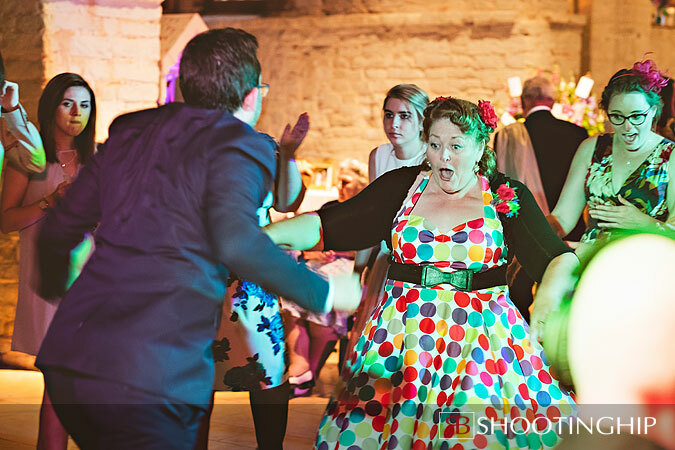 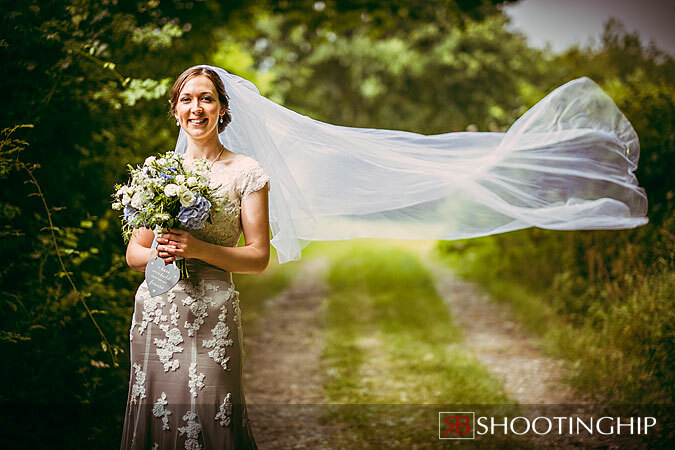 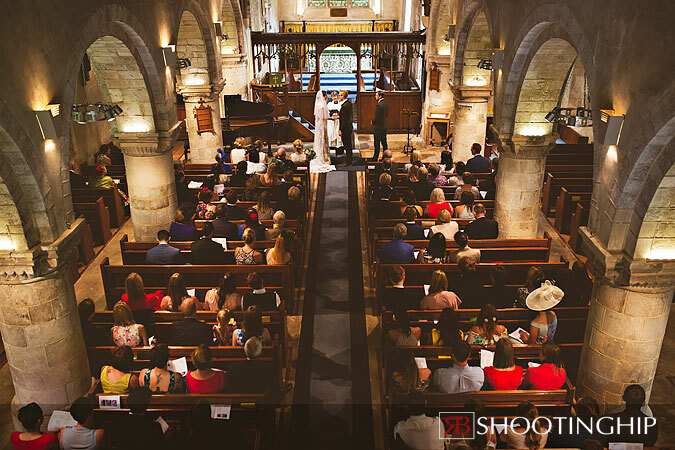 And shooting Tithe Barn weddings is always a treat. 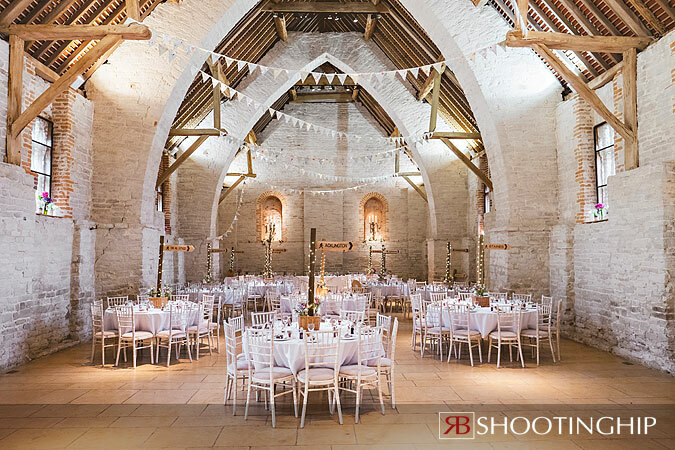 But I’m getting ahead of myself, Tithe Barn will have to wait, let’s start at the beginning. 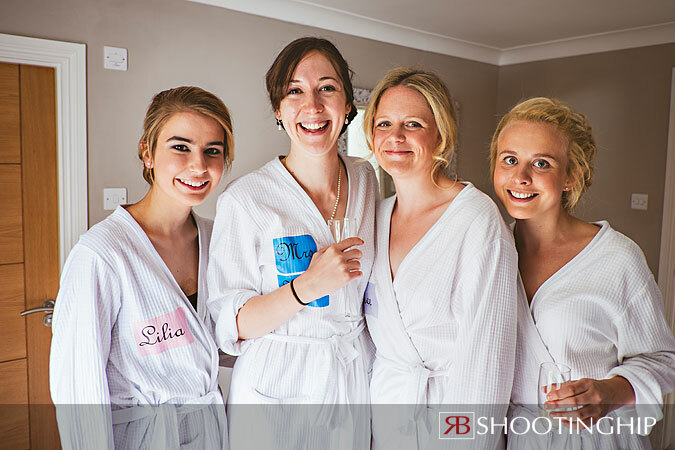 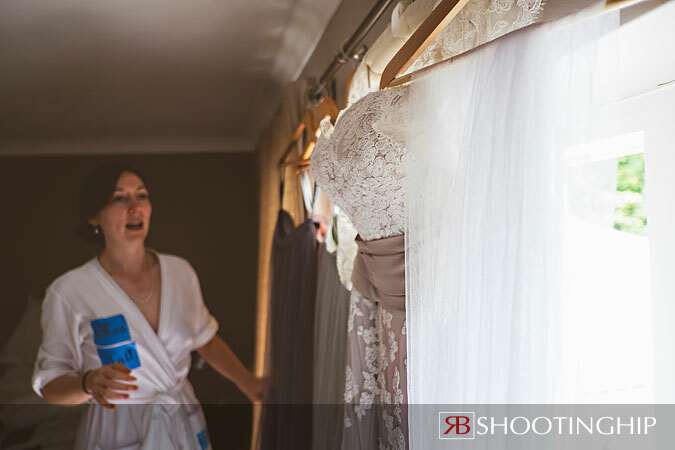 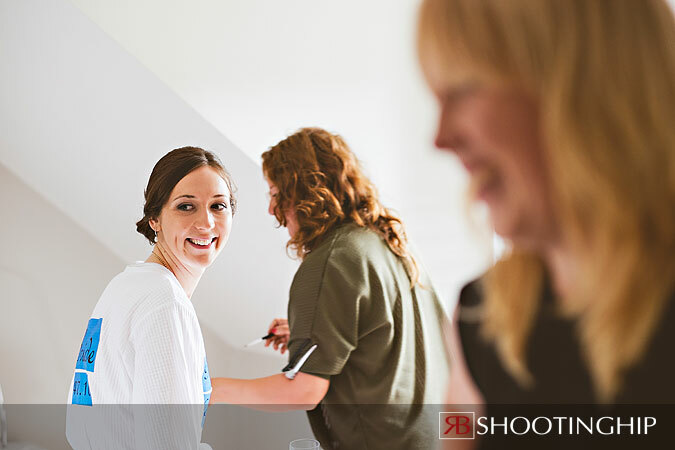 I arrived early on the day to get some shots of Emma as she prepared with her bridal party at High Trees (superb self-catering accommodation near Chichester). 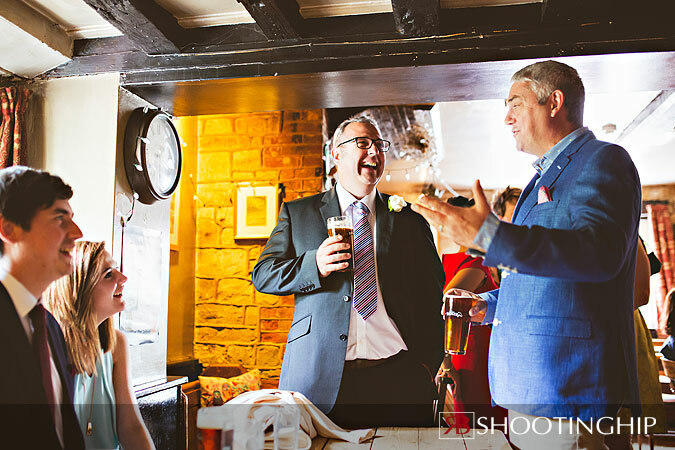 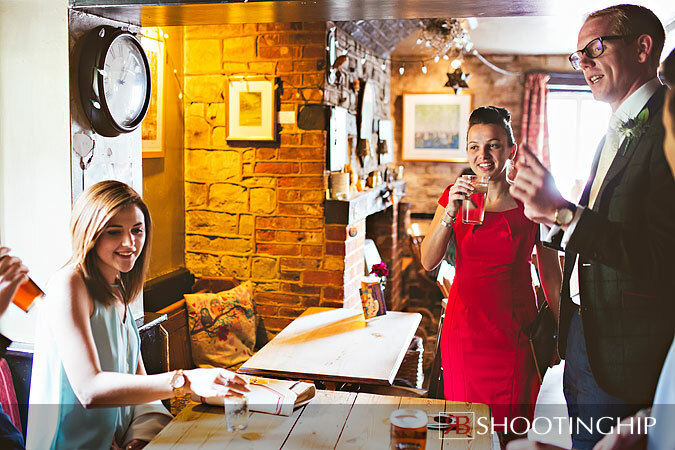 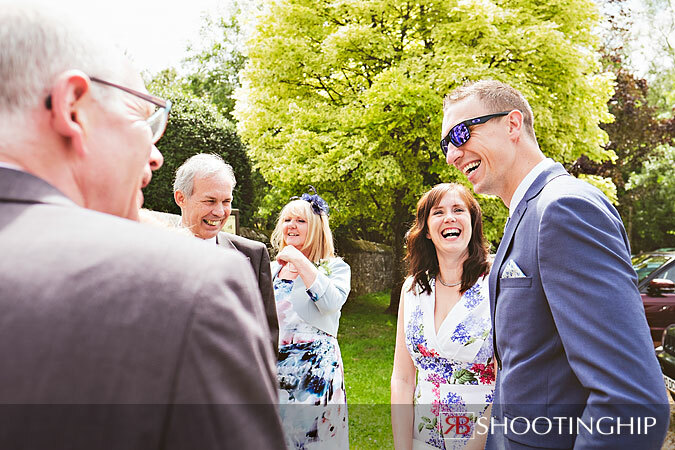 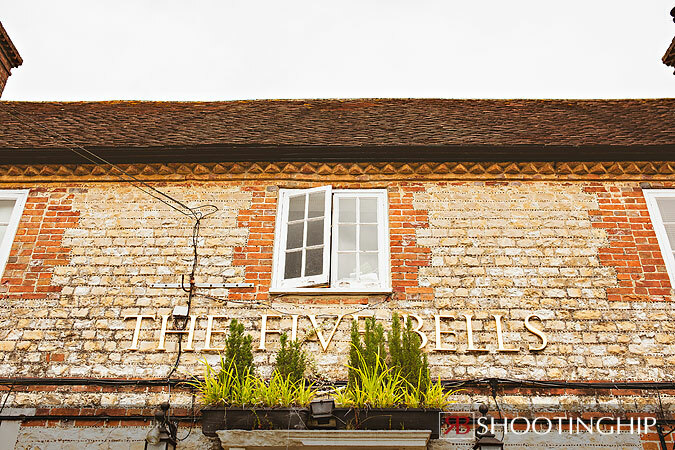 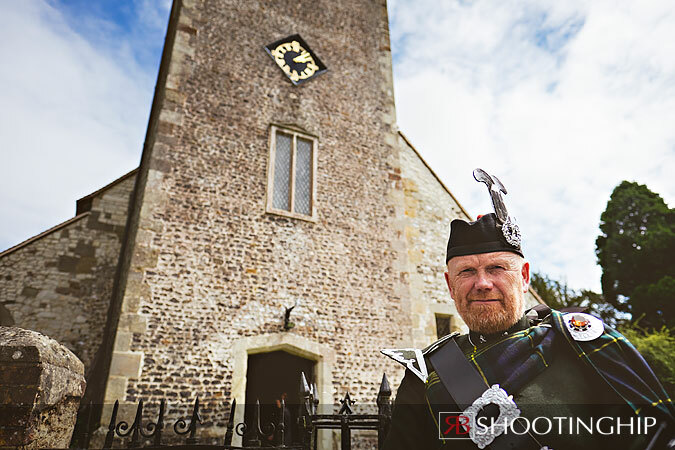 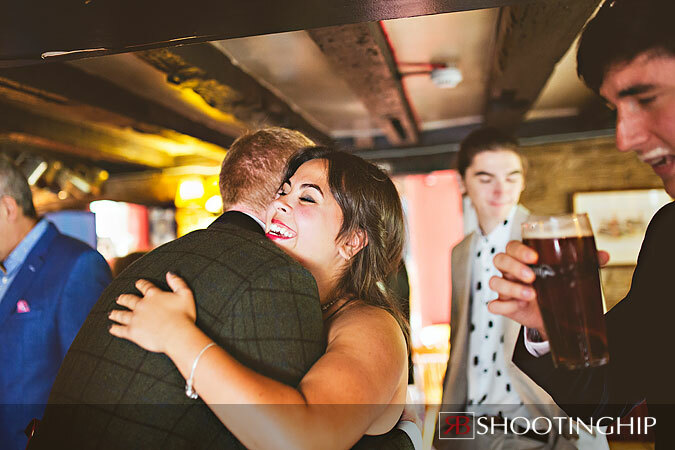 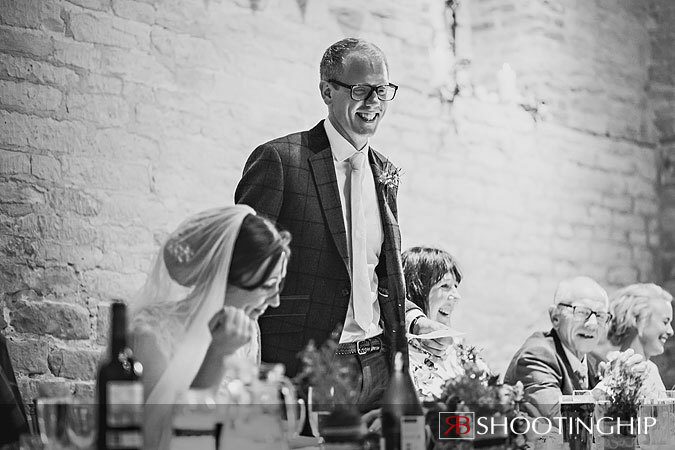 Meanwhile, Darren was at the Five Bells in Buriton to get a couple of shots of Andy who along with some of the guests, was enjoying a quick drink before the ceremony. 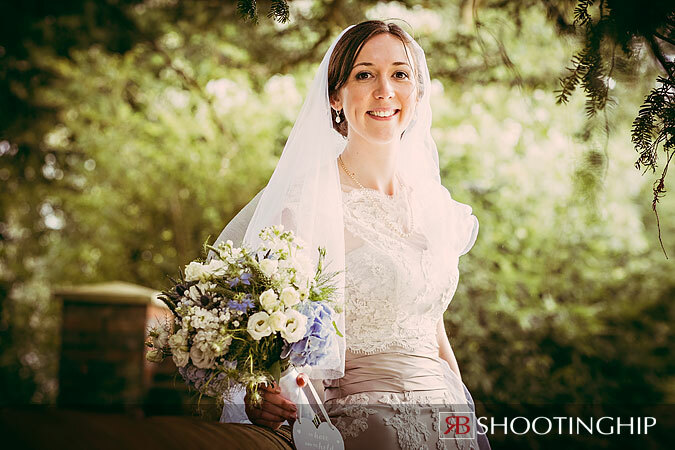 Emma looked radiant in her dress which was complimented by a full veil and gorgeous bouquet (which along with all the other flowers on the day was provided by the brilliant Michelle at Someflower). 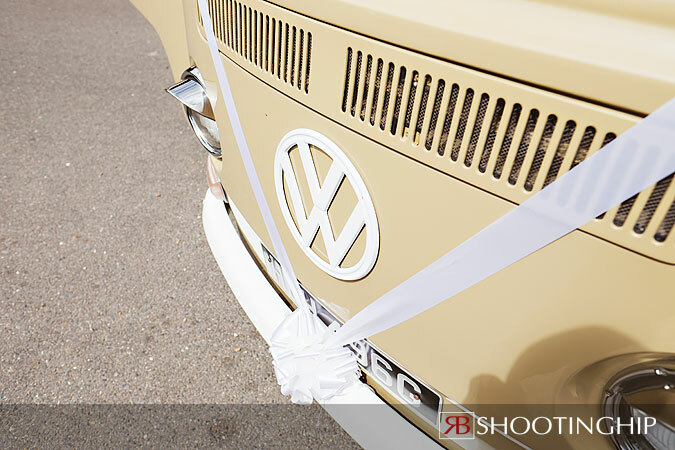 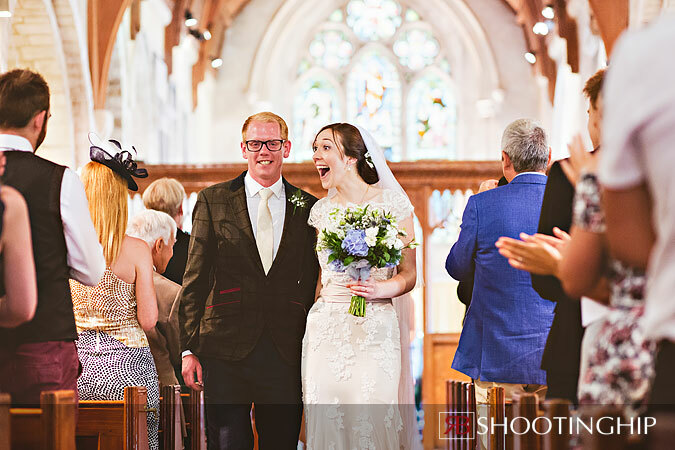 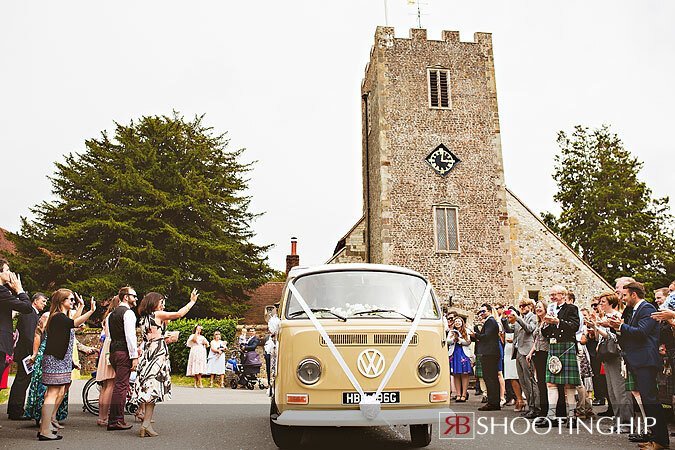 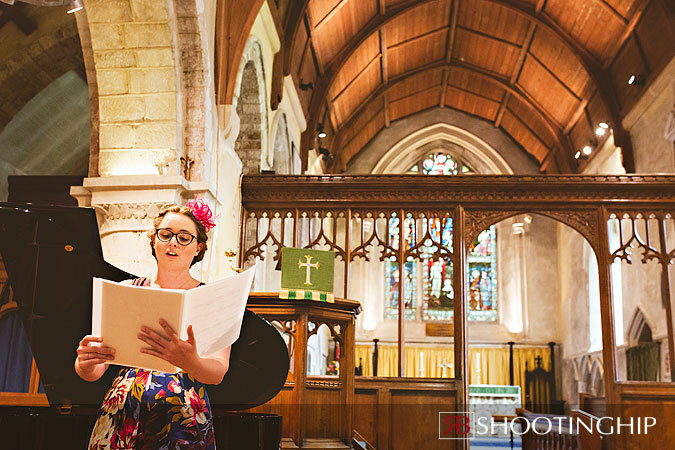 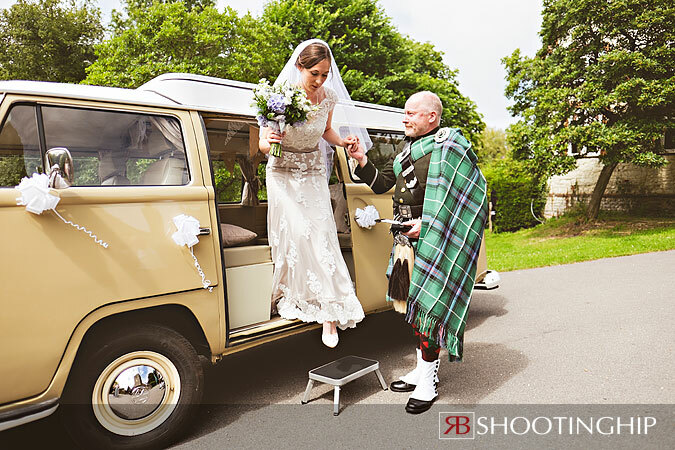 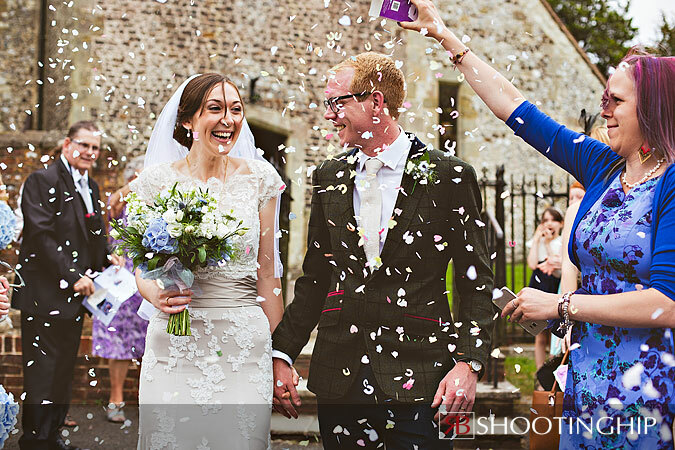 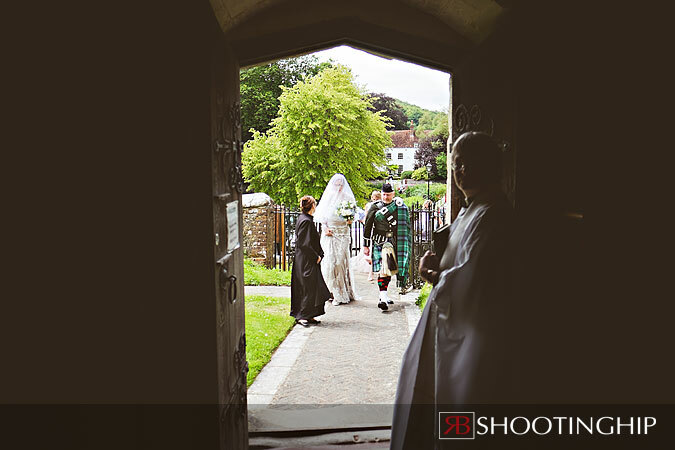 Once ready, Emma was whisked (in a classic VW camper van) to St Mary’s Church in Buriton for the ceremony. 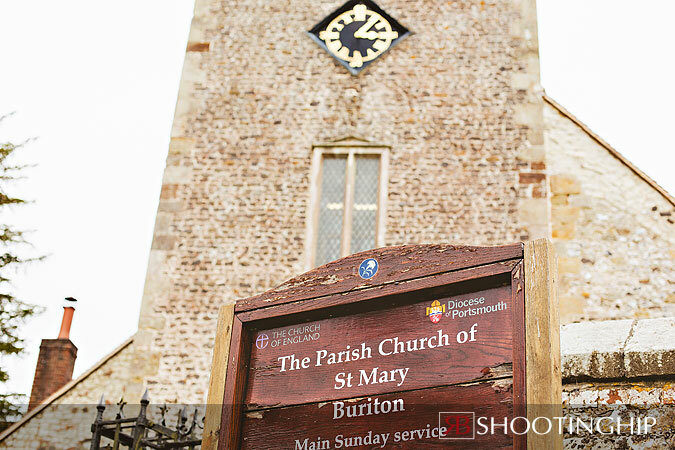 St Mary’s is a 12th century church that sits in the centre of this pretty village. 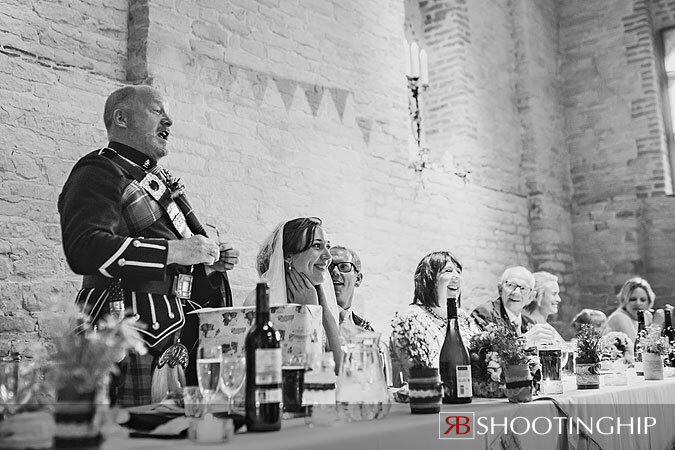 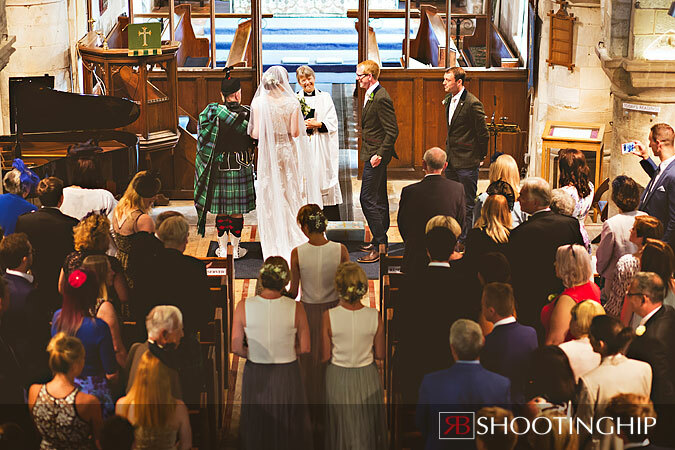 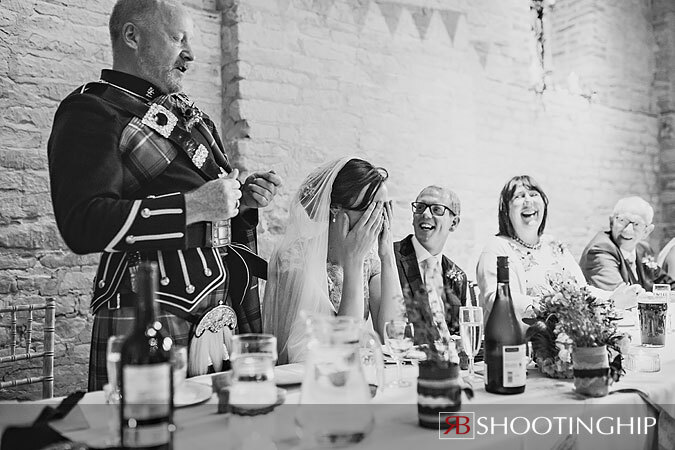 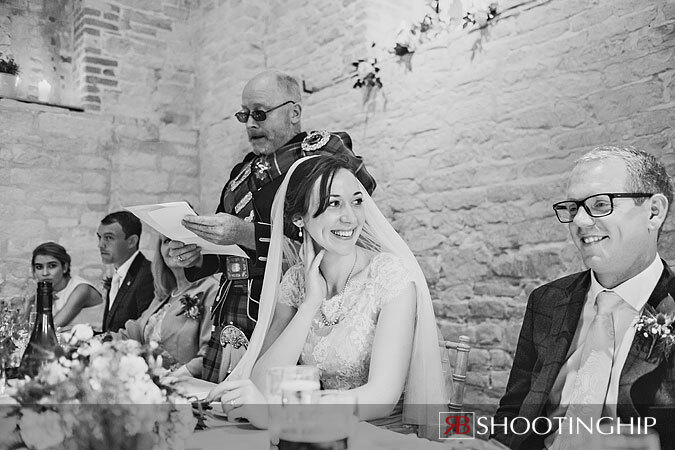 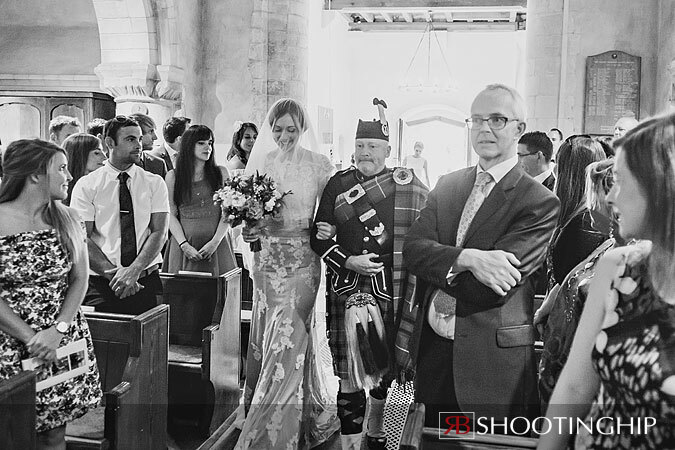 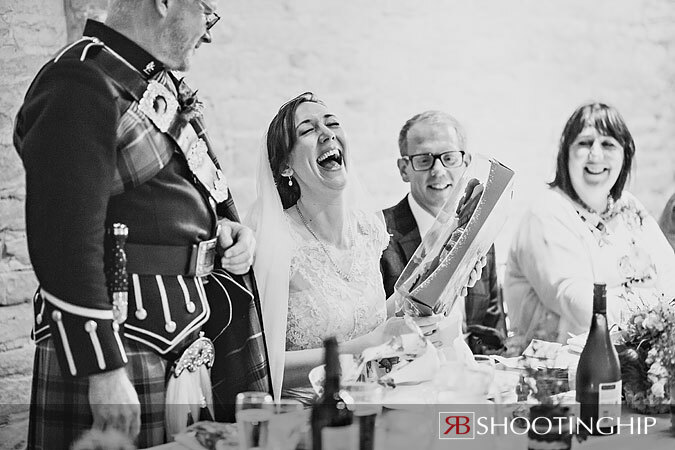 Emma was piped down the aisle by a traditional Scottish piper. 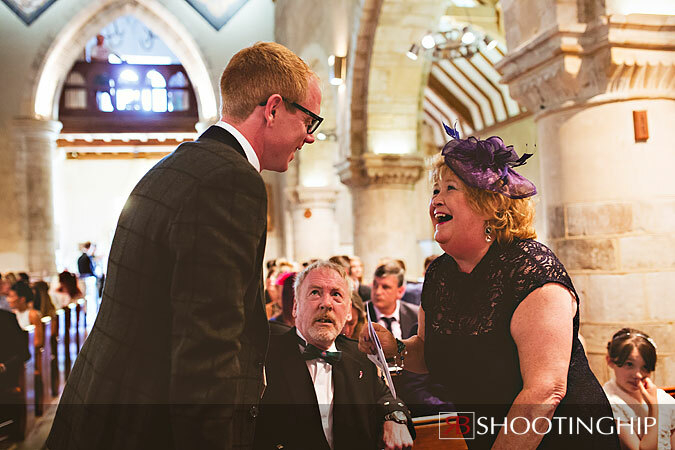 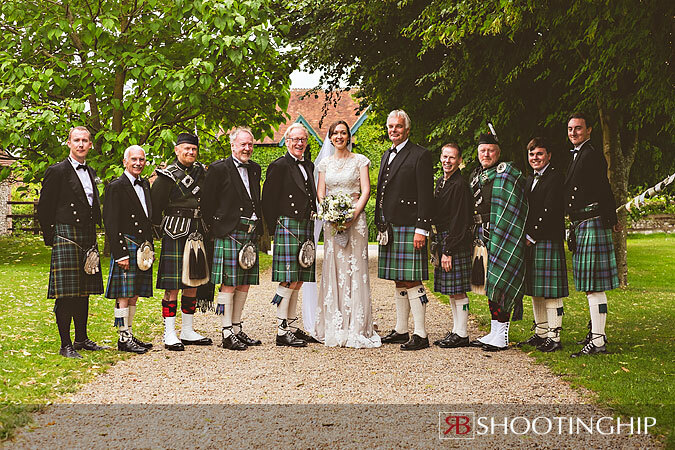 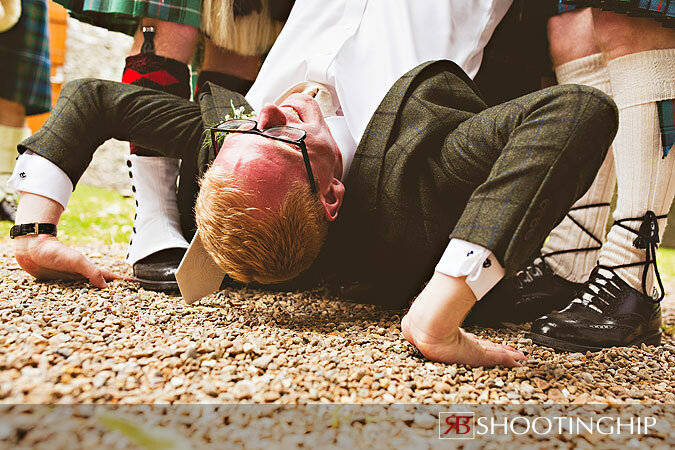 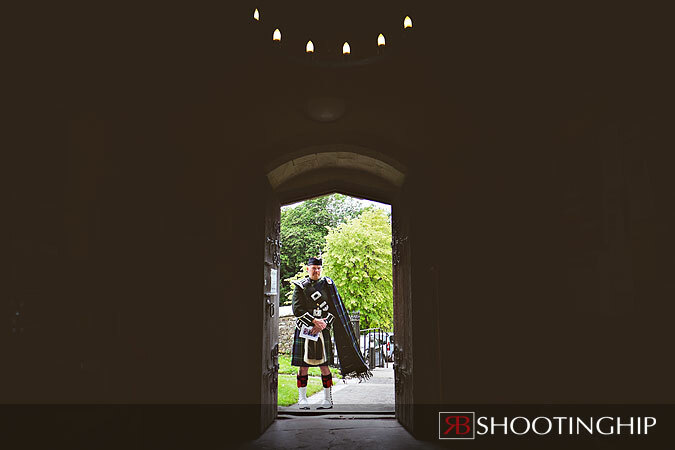 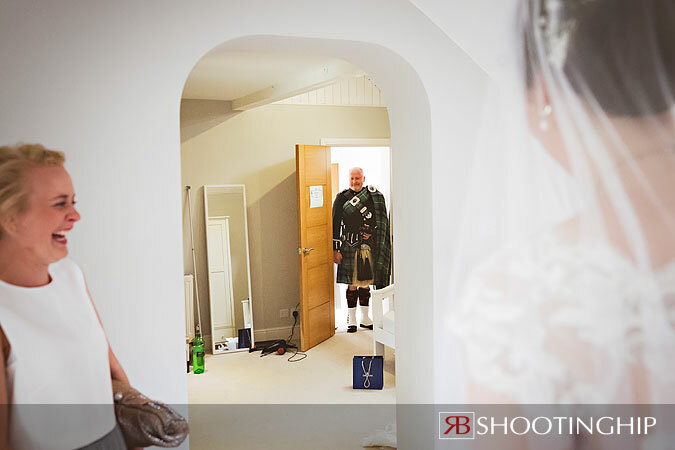 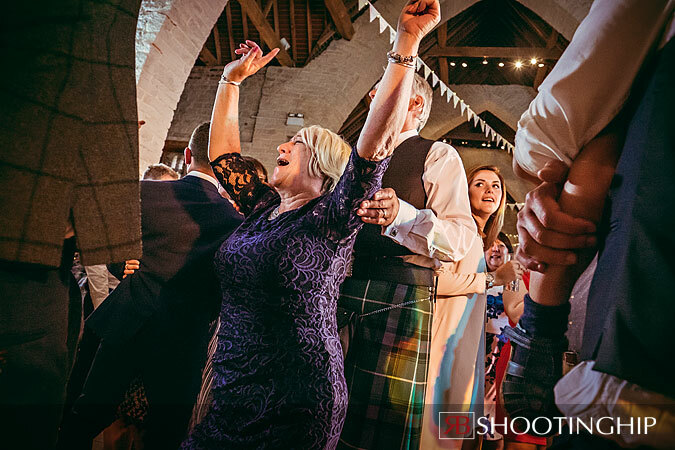 (It’s always great to see kilts at weddings!) 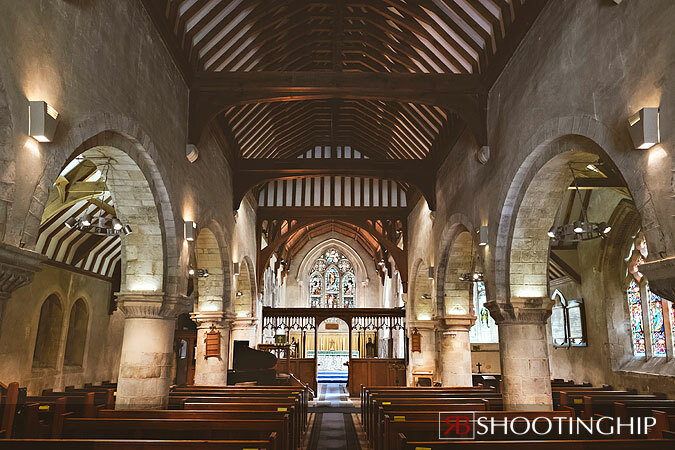 Churches are often dark places but St Mary’s have wisely invested in great lighting, which made my job so much easier! 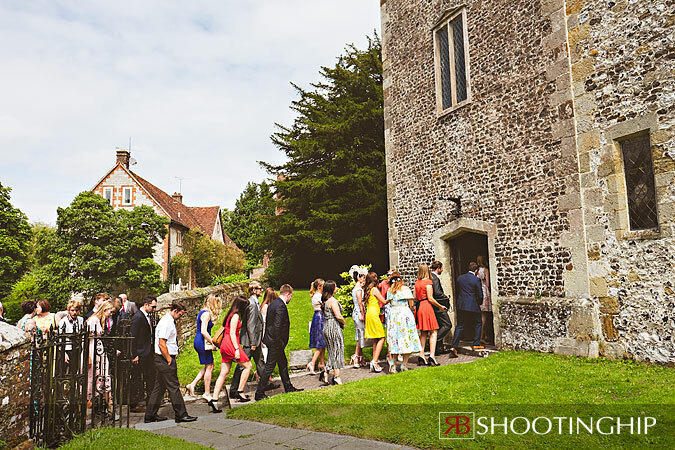 After the ceremony everybody headed to Tithe Barn for the reception. 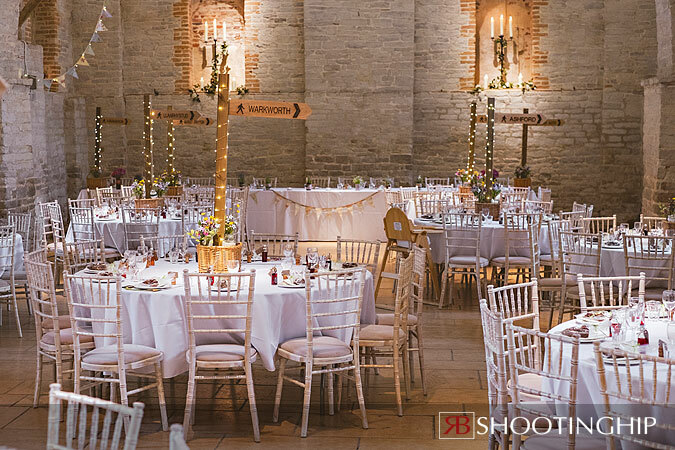 The barn was decorated to perfection and I must give particular mention to the table names which clever Andy made himself! 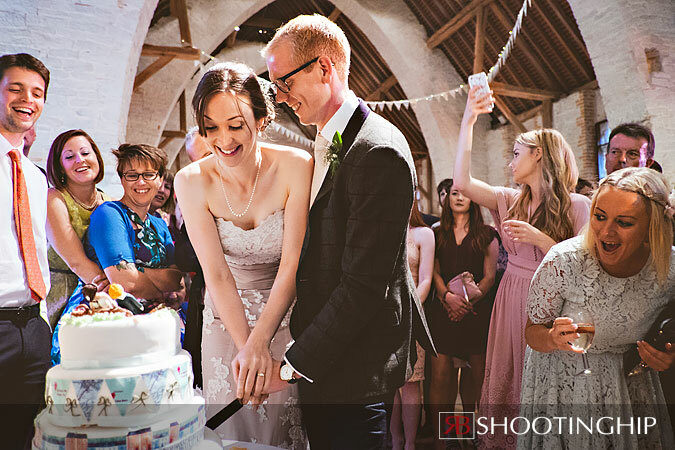 Emma and Andy wanted to do something different for their wedding breakfast so everybody was treated to an afternoon tea provided by Brian at Wright Choice Catering. 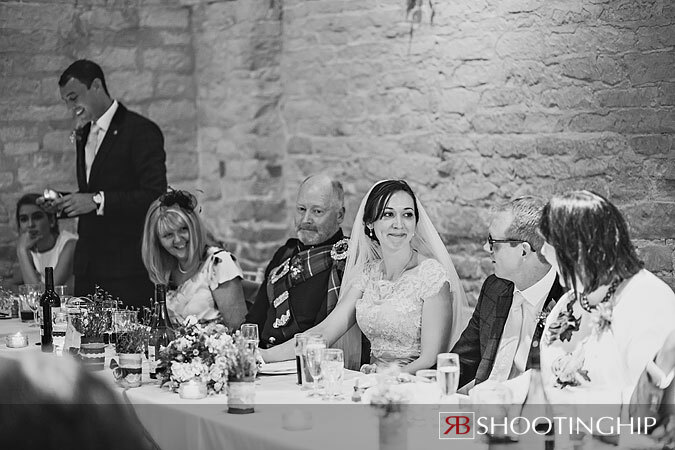 It was an inspired choice as it suited the relaxed ambience of the wedding and kept everybody full right up to the hog roast laid on later in the day. 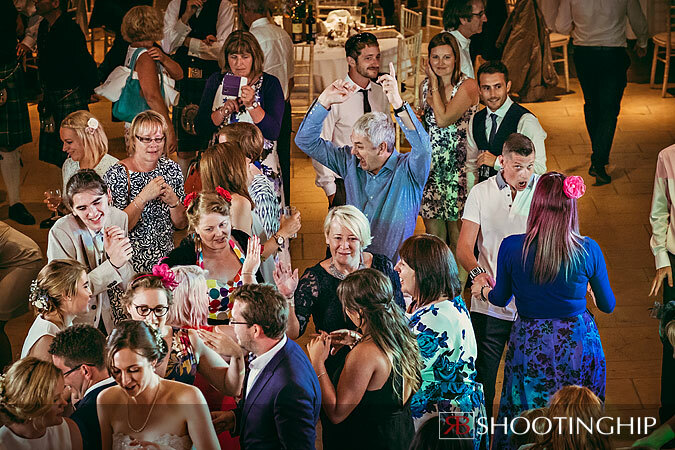 The day was perfectly ended with live music which had everybody up and dancing well in to the evening. 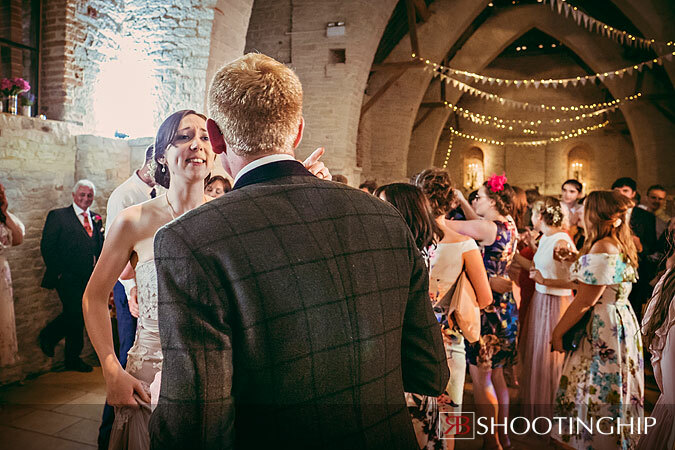 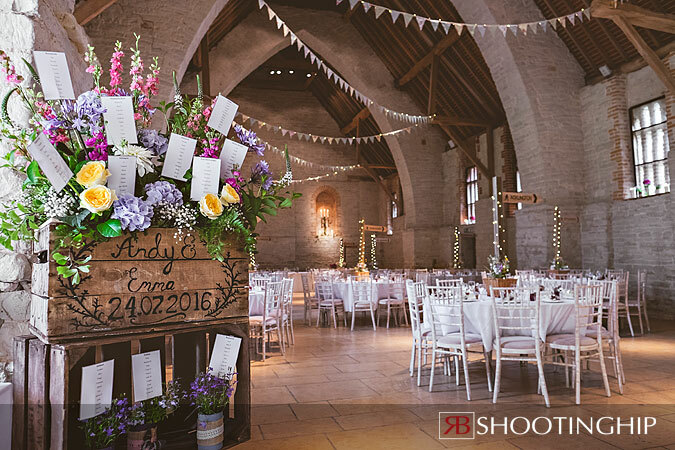 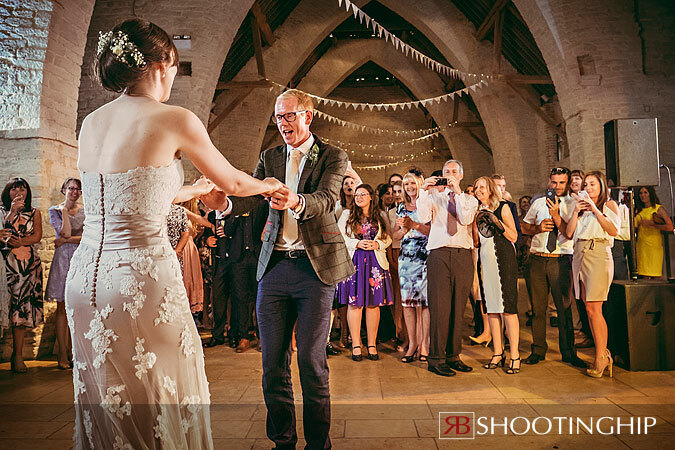 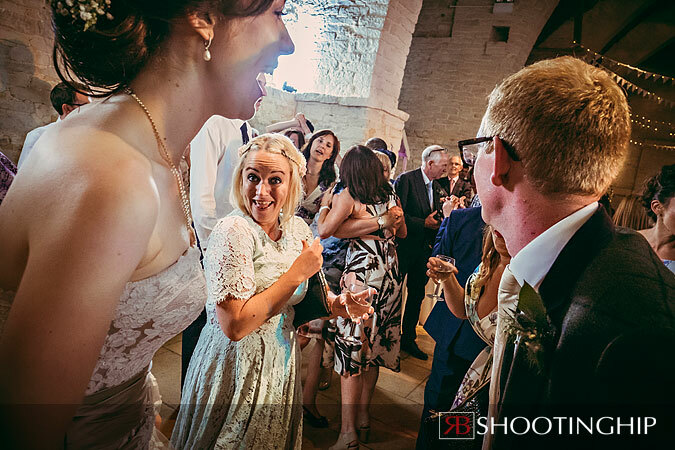 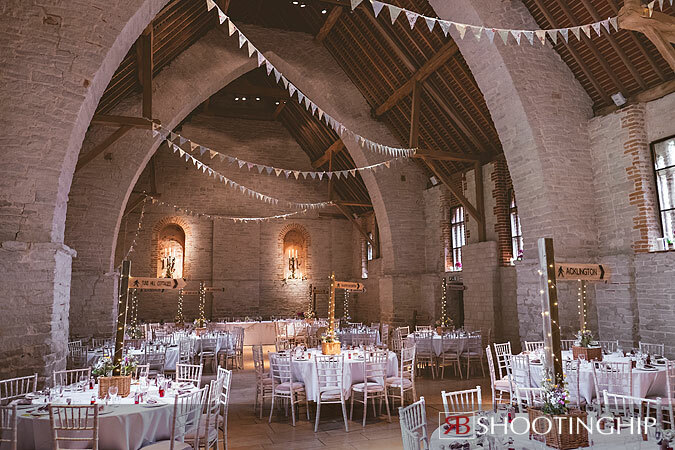 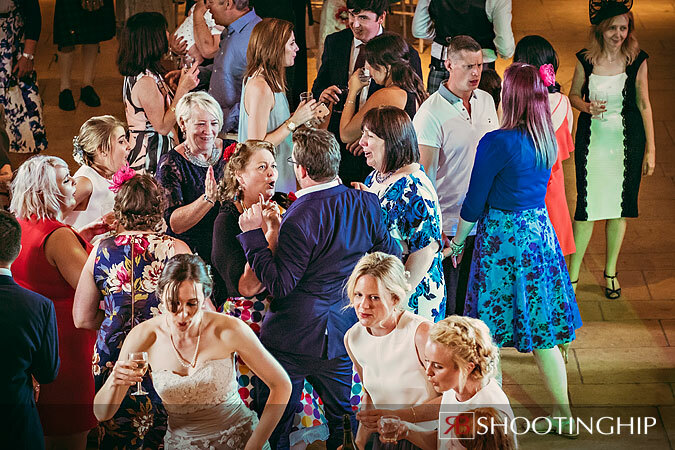 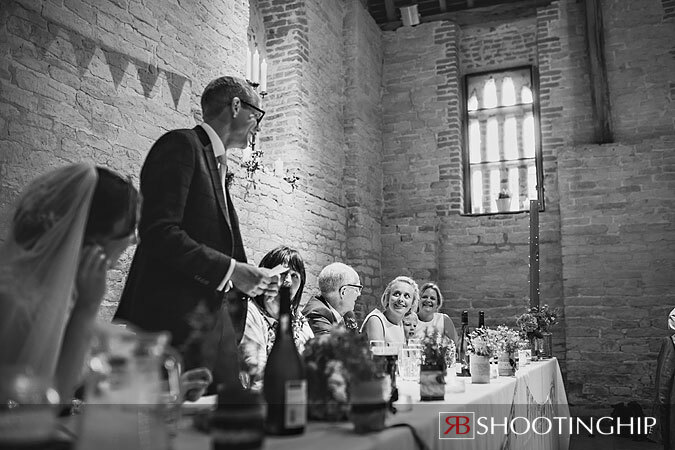 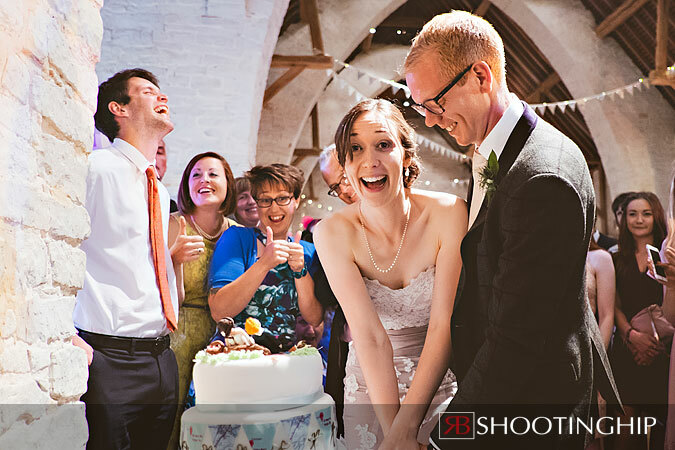 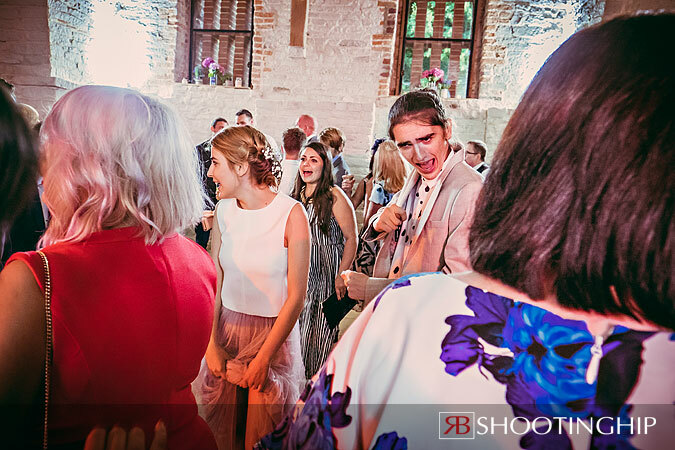 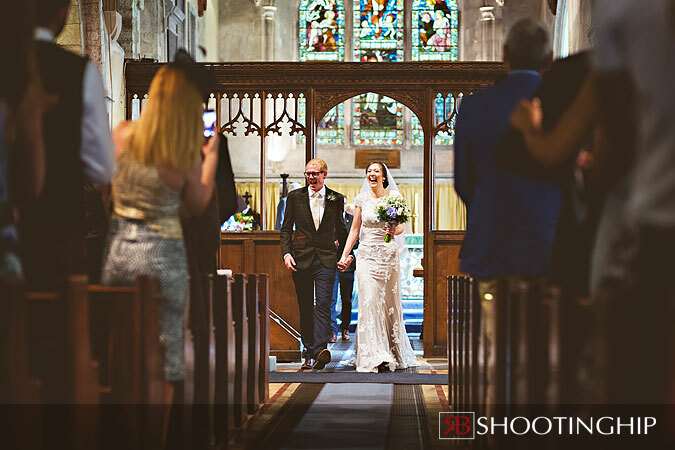 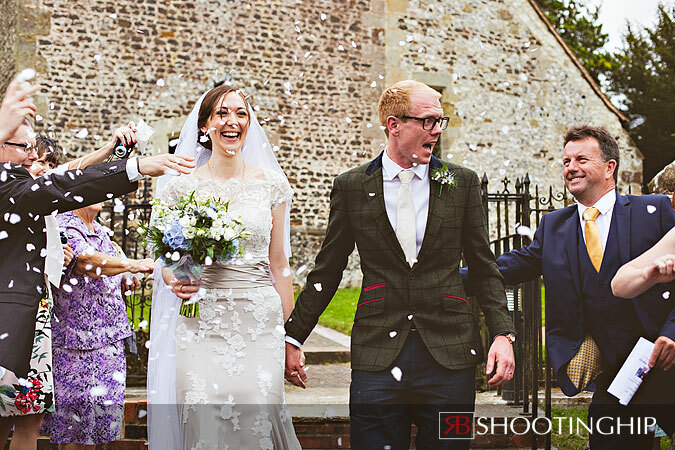 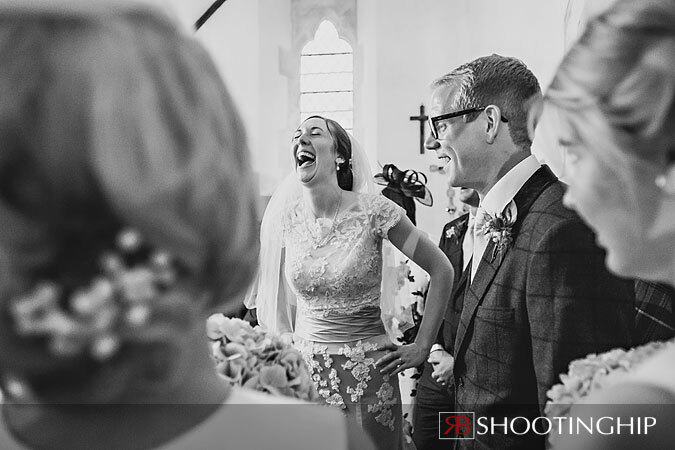 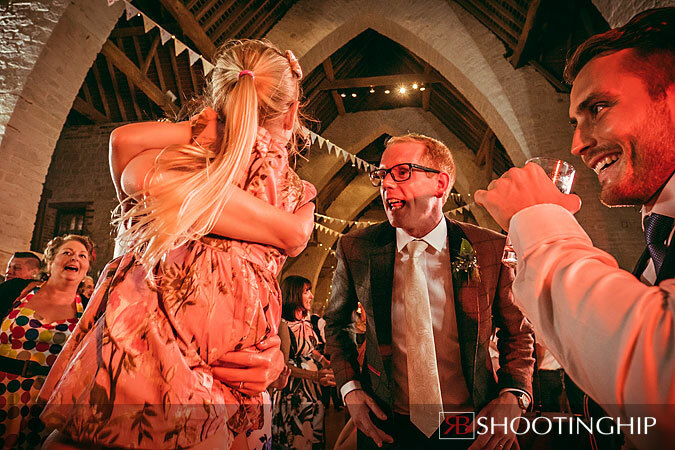 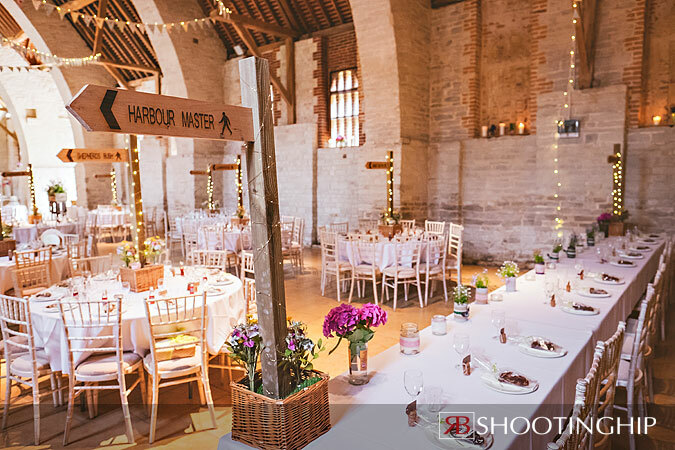 Photographing Hampshire Wedding photography venues like Tithe Barn is amazing but the real key to an amazing wedding day are fun, friendly and thoughtful couples like Emma and Andy. 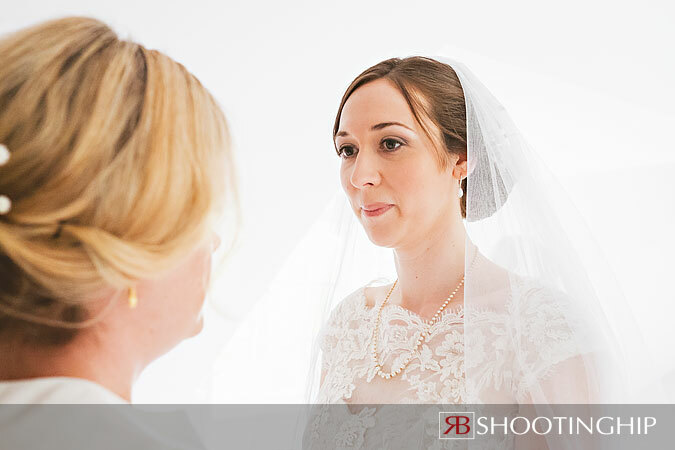 Congratulations to both of you. 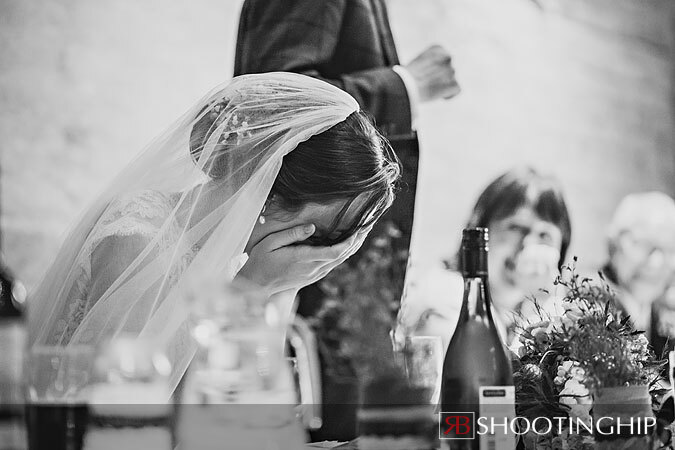 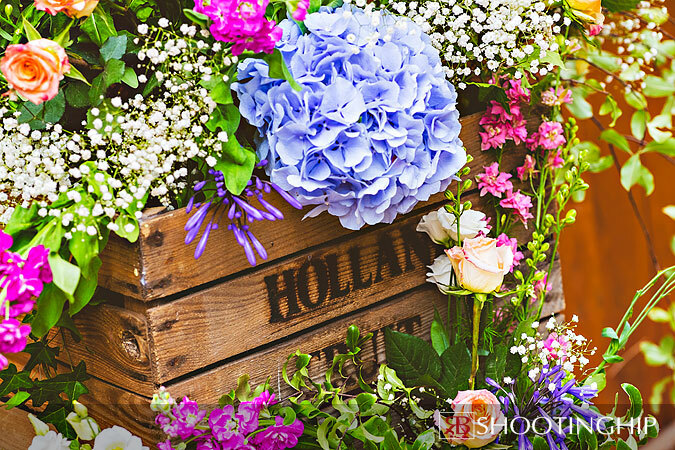 I hope my images will enable you to relive your day again and again for many years to come.